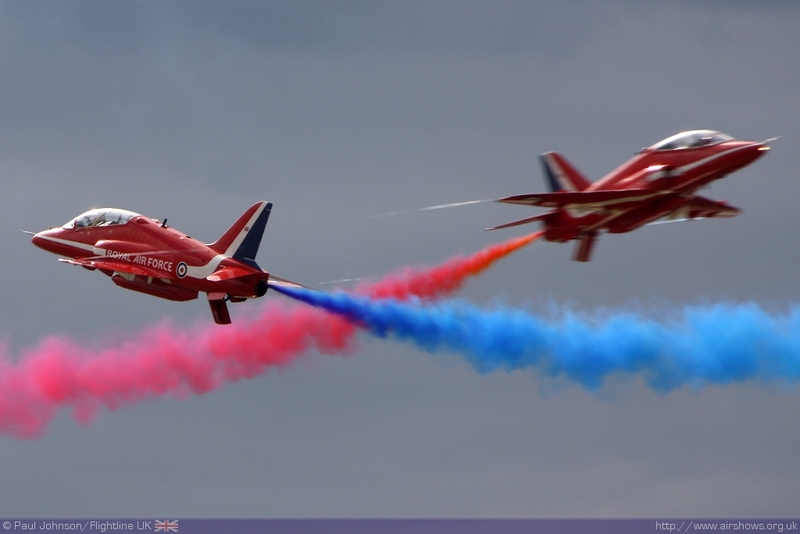 Every two years, perhaps the world's most famous airshow is held at Farnborough Aerodrome in Hampshire. 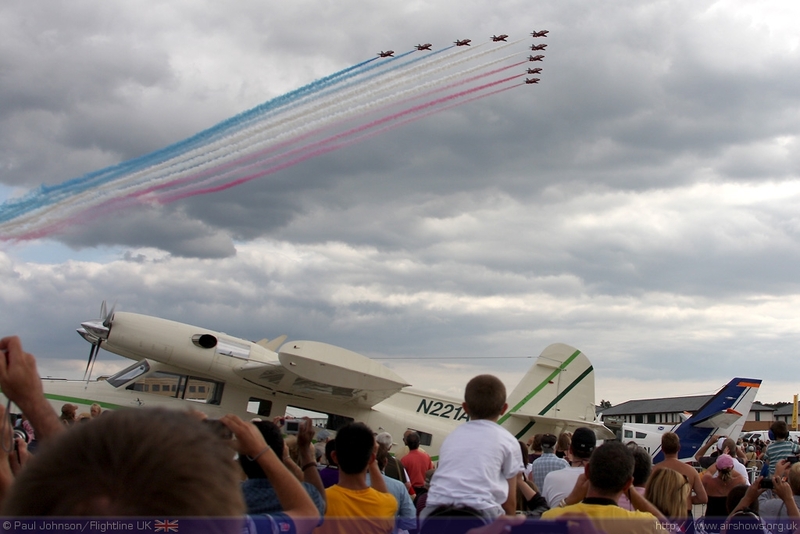 "Farnborough" is a household name even to those who don't regular attend airshows and is famous the world over for bringing the latest aviation technology and displays under the spotlight. 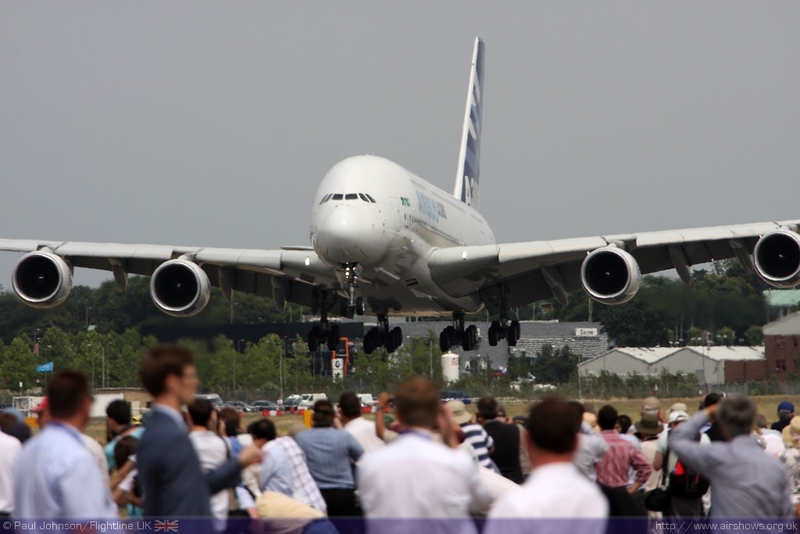 2010 was expected to be a difficult year for Farnborough with the effects of global recession biting hard, but from a business view it was perhaps one of the most successful shows ever. Unsurprisingly, almost all of the business involved the commercial sector, with little in way of military orders being announced at the show. 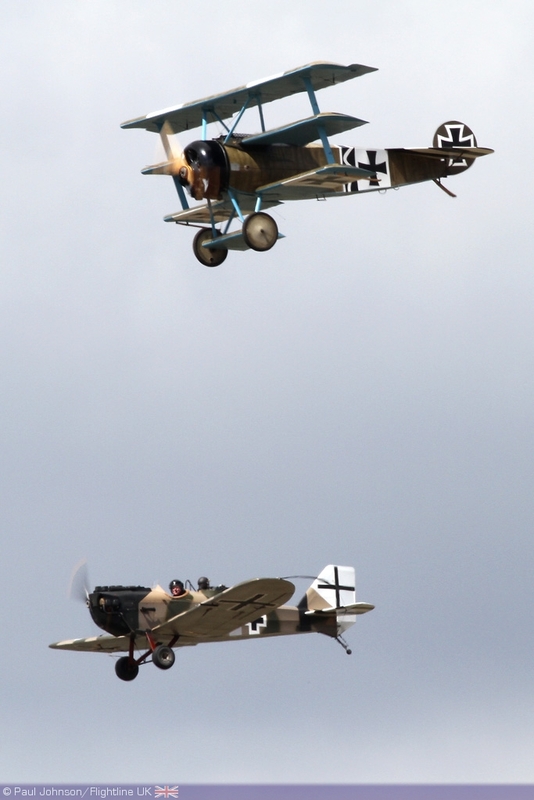 The final two days of the show are the public days which attracted massive crowds for an extended flying display involving the best civilian displays and warbirds on top of the pick of the trade displays. 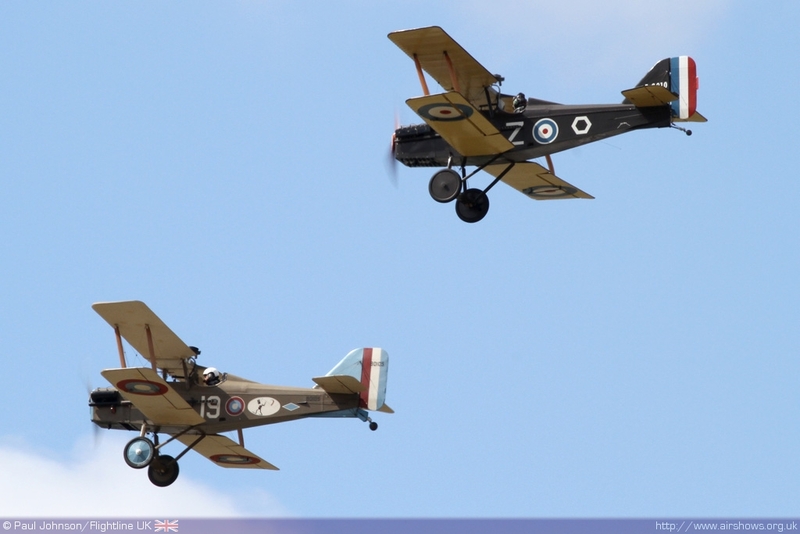 Paul Johnson/Flightline UK reports from Hampshire. All photography copyright of the Author. . 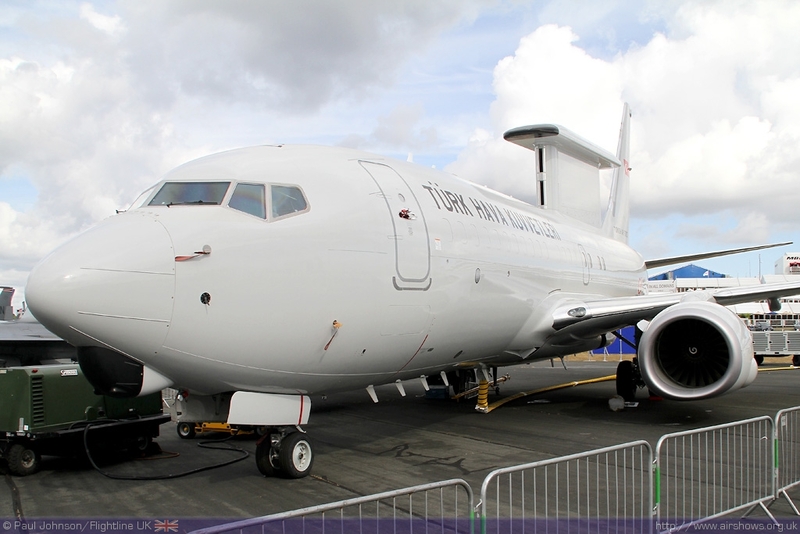 Optimism was the buzz word at this year's Farnborough International. 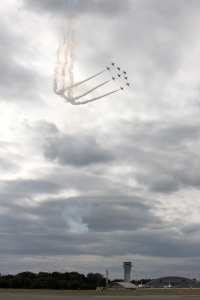 The airshow was bigger than ever with 1450 exhibiting companies in the halls and chalets that overlook the airfield. By the Thursday, over £31 Billon ($47 Billion) of orders has been placed at the show, just under half the value of orders placed in 2008, but still higher than that of 2006. 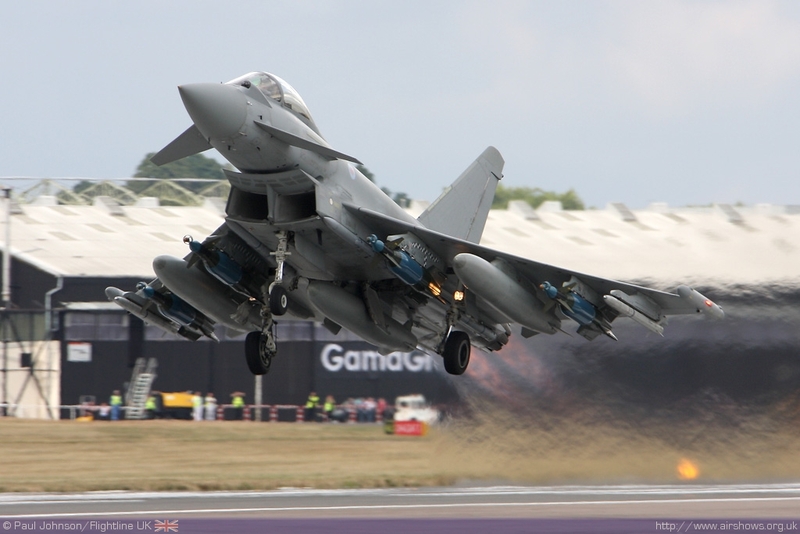 "The 2010 Farnborough International Airshow has been very successful and the figures demonstrate the mood of strong optimism that there has been around the show this year, which is very encouraging given the current global economic climate. 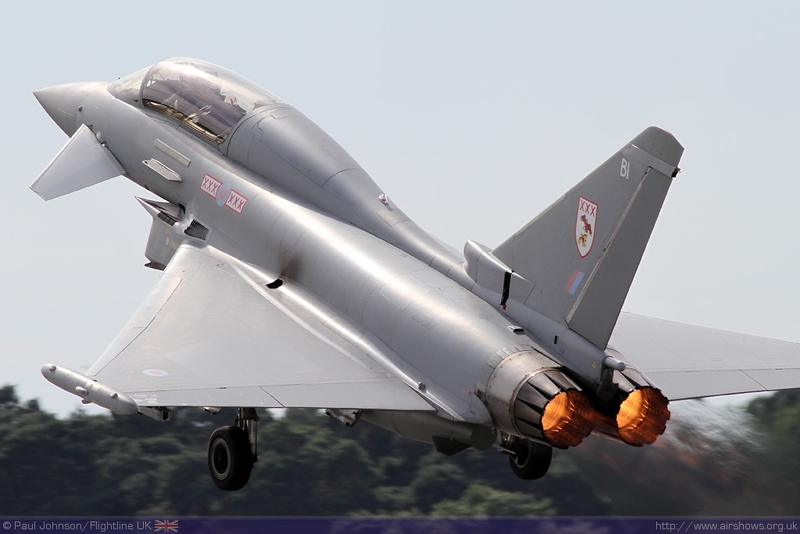 To see over $47 billion dollars worth of business done and the quality of the business transactions at the show is a testament to the endurance of our sectors, their positive contribution to UK and world trade as well as the significance of the show itself." 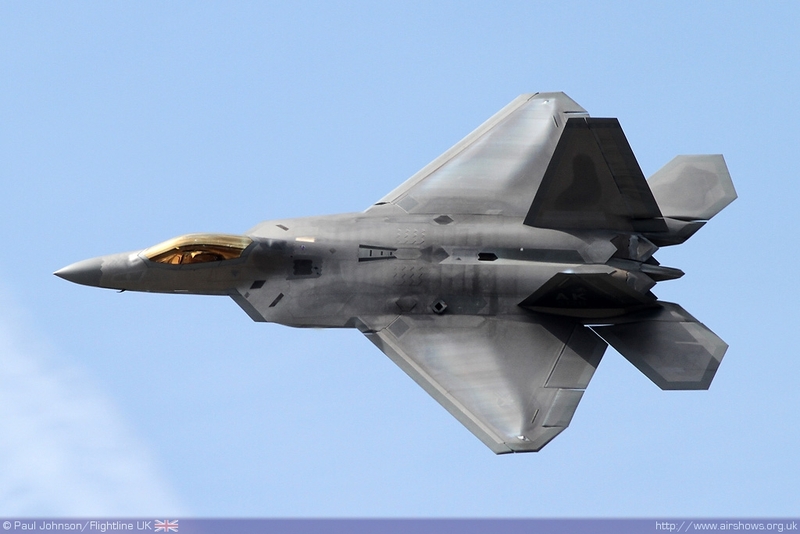 commented Ian Godden, Chairman of A|D|S, the organisation that runs Farnborough International Ltd. 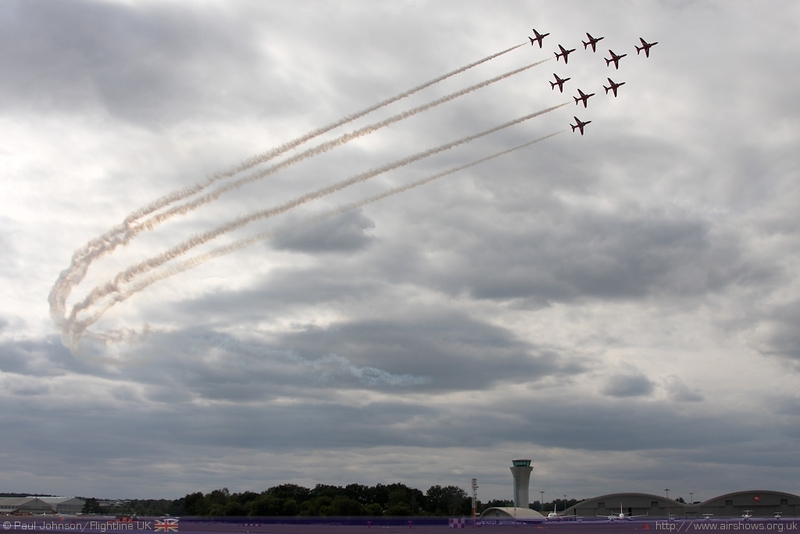 The Farnborough International Airshow runs for seven days and contains the world's largest temporary exhibition area, and during that period 152 aircraft participated at the show. 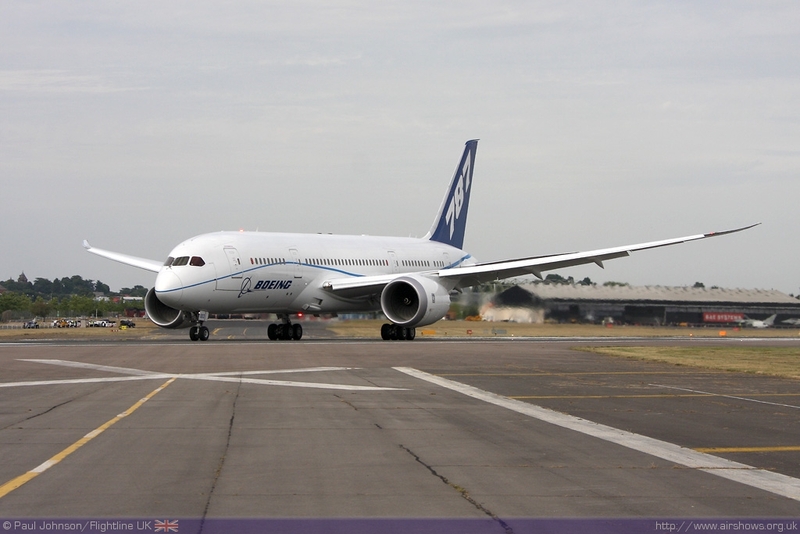 Hitting the headlines early in the week was the Boeing 787 Dreamliner. 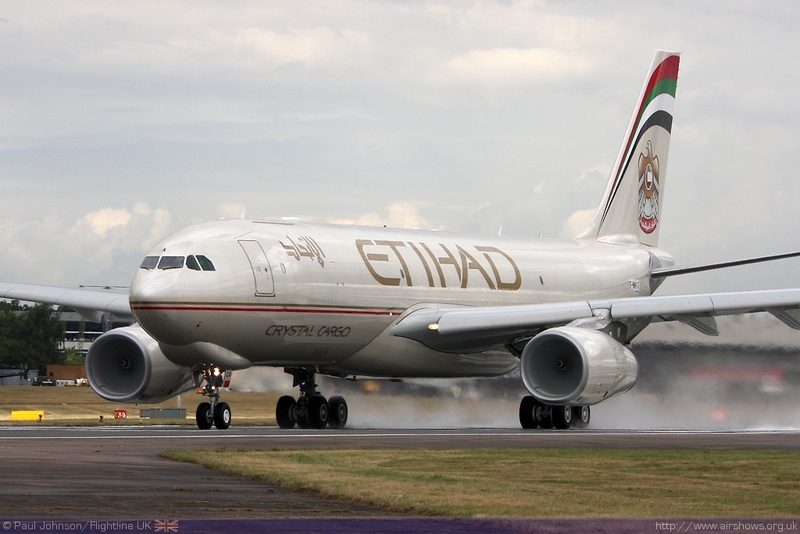 It was the aircraft's first ever overseas visit and there its first ever transatlantic crossing, a route on which the type is set to become a regular sight. 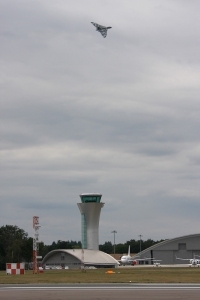 The Dreamliner only stayed for the first two days of the airshow before departing at the end of Tuesday's flying display. 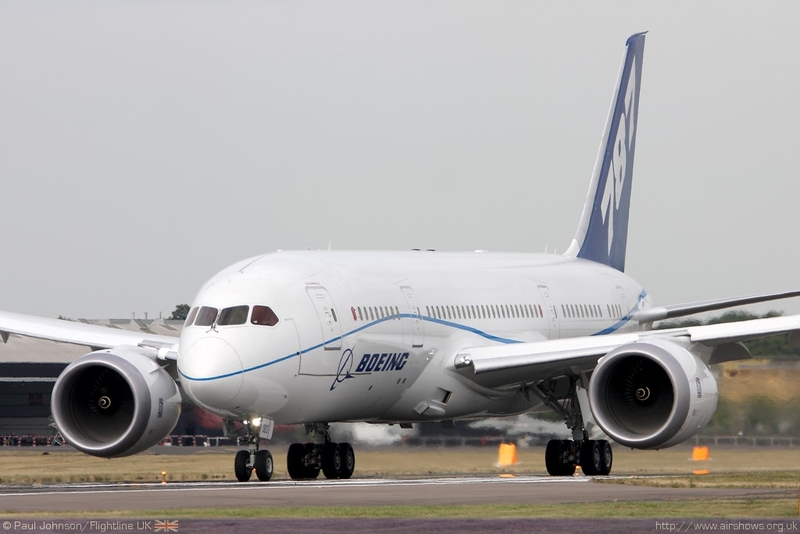 The 787 is an beautiful aircraft to watch take off, it wings flex upwards and look just like the wings of a large soaring glider. 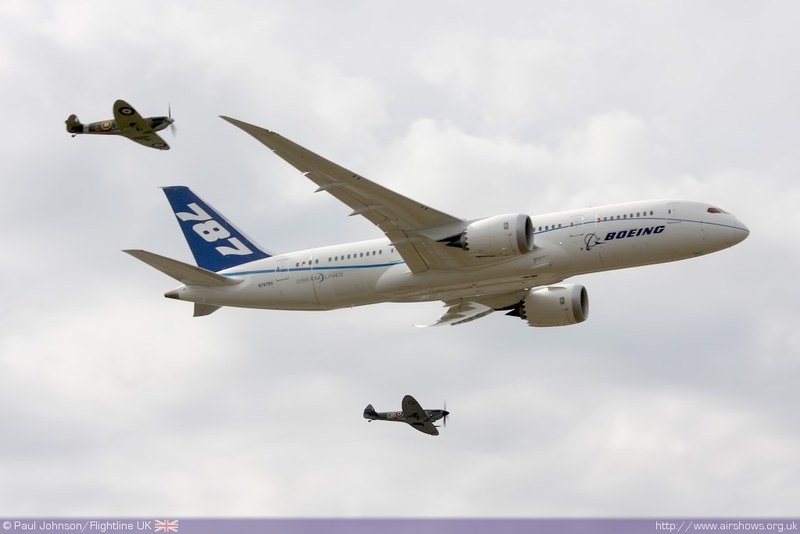 After taking off, the 787 was joined by two Spitfires, Sheringham Aviation's Spitfire Ia and Spitfire Ltd's Spitfire XVI, for a spectacular and historic flypast before departing for a visit to Derby and then across the Atlantic. 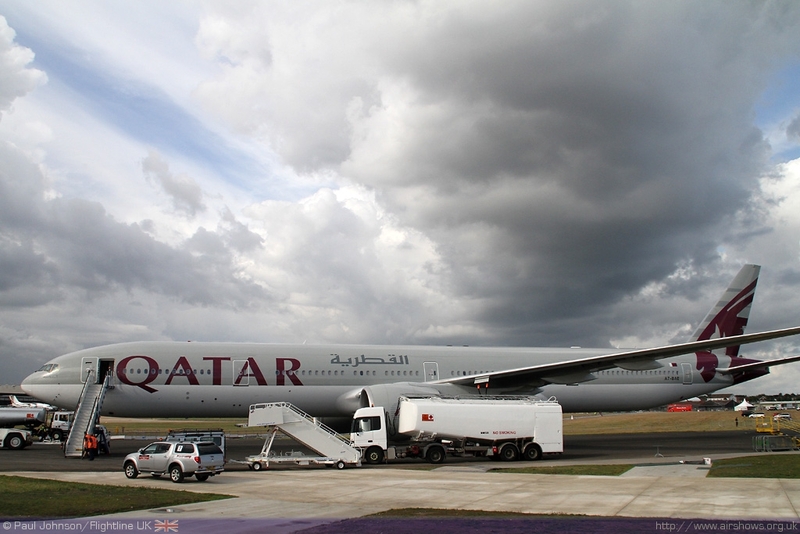 Boeing also exhibited a 777-300ER in Qatar Airways colours. The 300ER is a stretched version of the 777 and is another truly impressive aircraft but again it departed early on the Thursday evening. 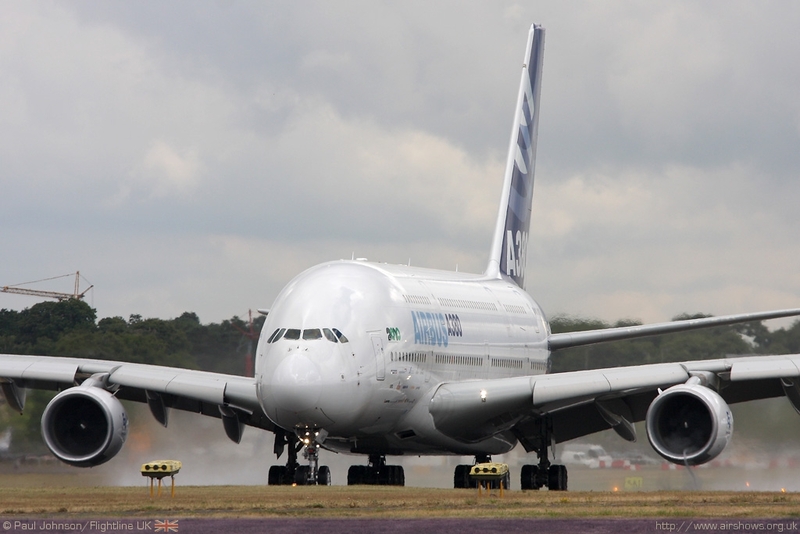 Airbus, Boeing's great European rival, was out in force again at Farnborough. 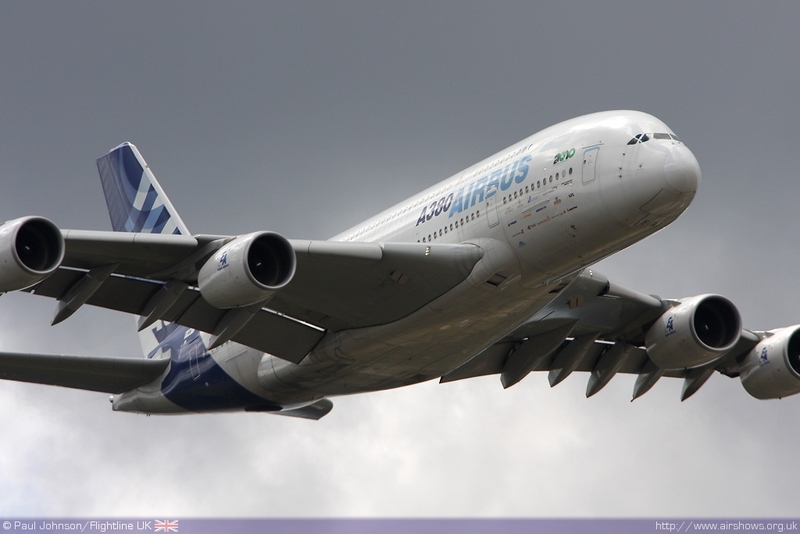 It again presented the truly awesome Airbus A380 in the flying displays throughout the show. 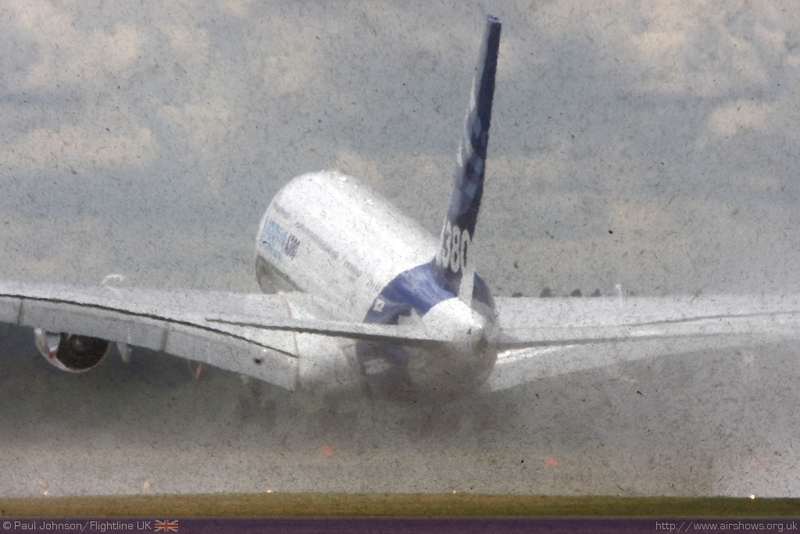 The sight if such a large aircraft showing off its outstanding agility is always a real highlight of the Farnborough Airshow. 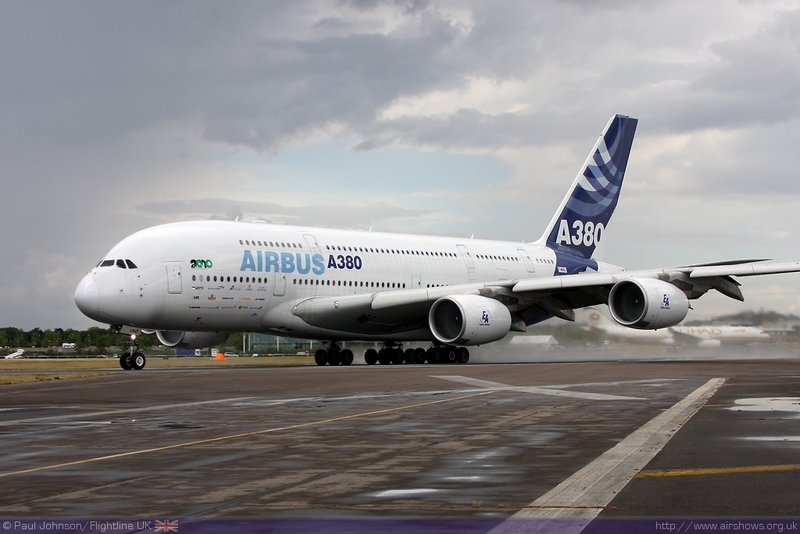 The A380 was joined on the ground for the first four days with the "smaller" A330 in a Ethiad freighter colours. 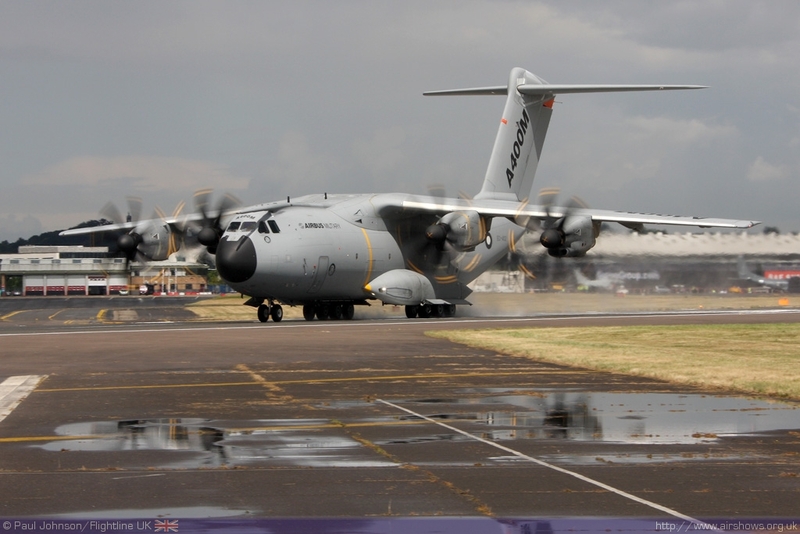 But the biggest Airbus news story at Farnborough was the debut of the Airbus A400M, the companies first military aircraft that has been dogged by cost overruns and delays. 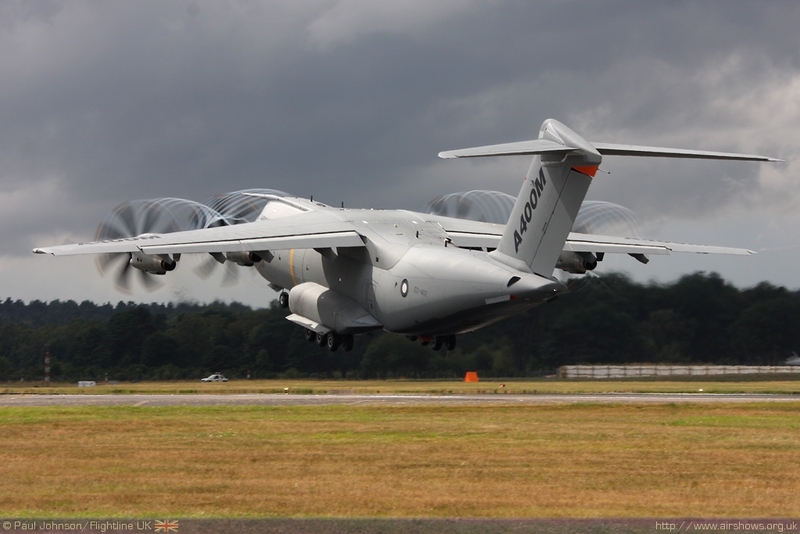 It was an impressive flying display debut of the future airlifter, but Airbus gained a mixed response to its naming of the aircraft "Grizzly!" 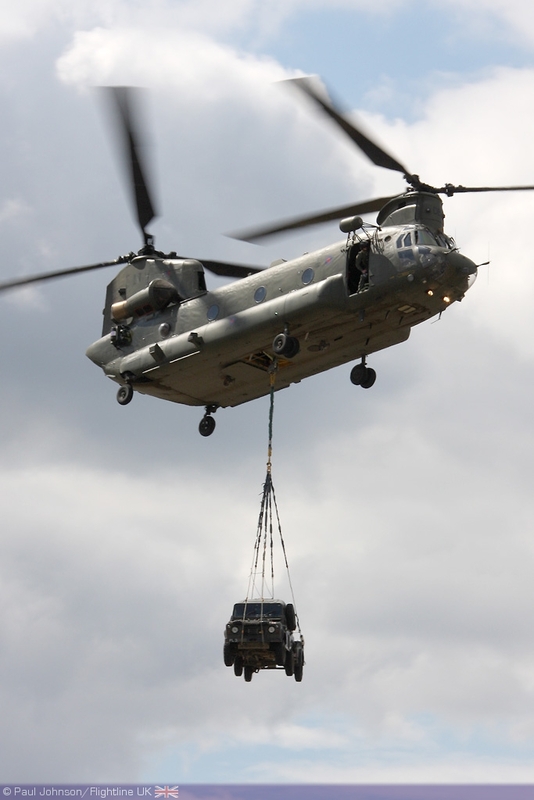 The RAF were clearly unimpressed which led to Airbus announcing that only the prototype had been christened with the name. 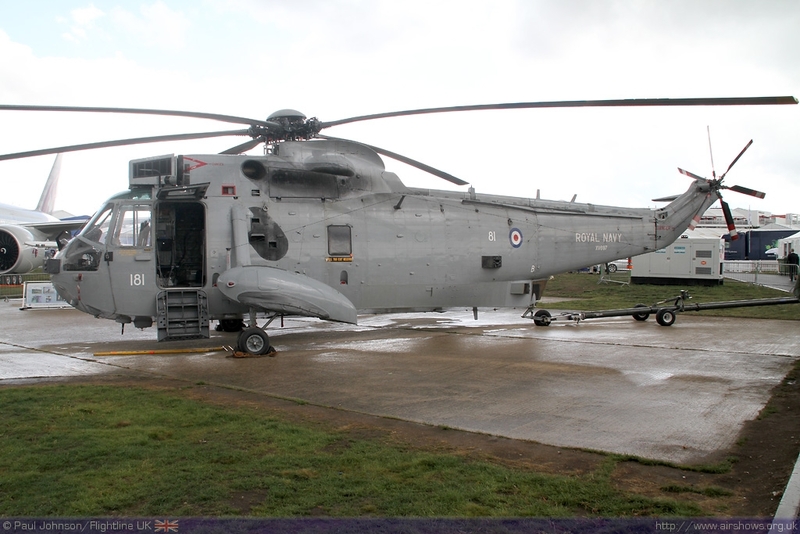 "Bear prints" were painted all over the tarmac roads inviting visitors to meet "Grizzly" but sadly for Friday and public day visitors the aircraft had departed on Thursday like so many other interesting aircraft. 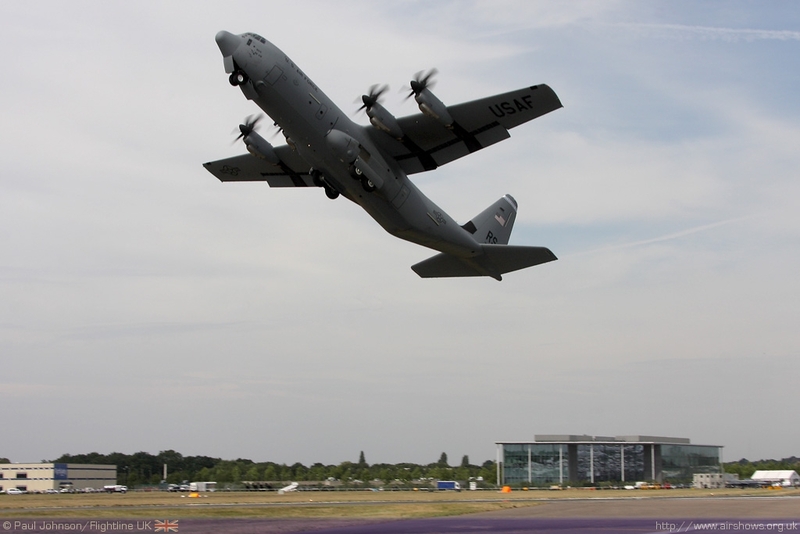 It was something of a showdown of the new generation of military airlifters during the Farnborough flying display. 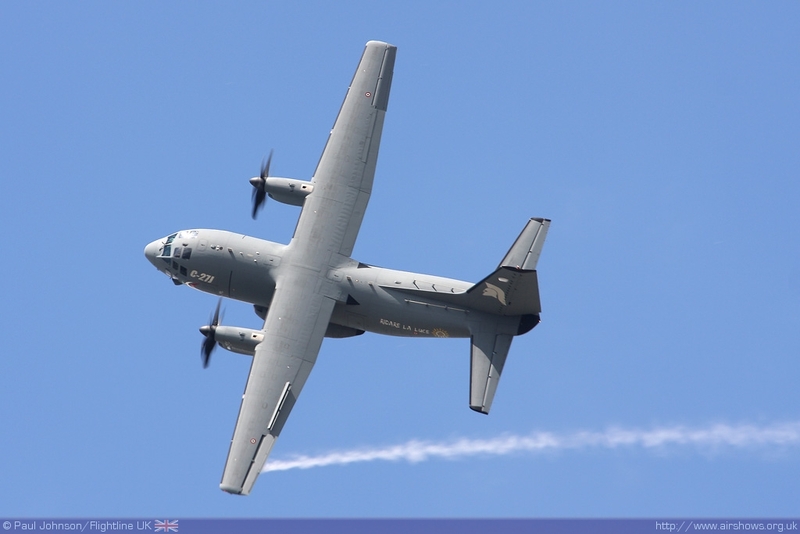 Alenia's C-27J Spartan returned with its usual aerial antics which included more steep climbs and jaw dropping descents than ever before. 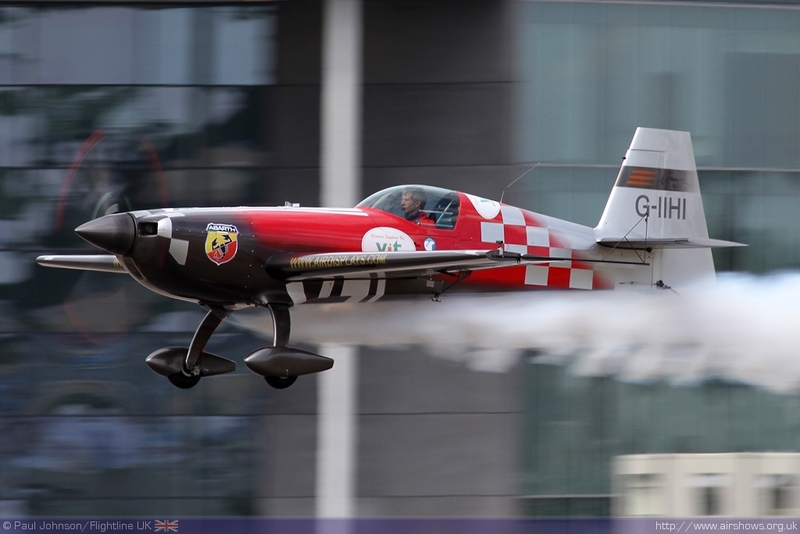 It even included a "crazy flying" pass at slow speed before performing an impossibly short landing. However, it was the Lockheed Martin C-130J Hercules II that stole the show for many. 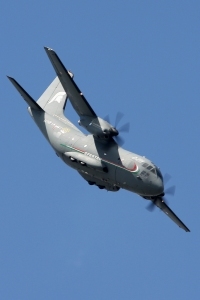 This must have been the most near-aerobatic display of a Hercules ever. 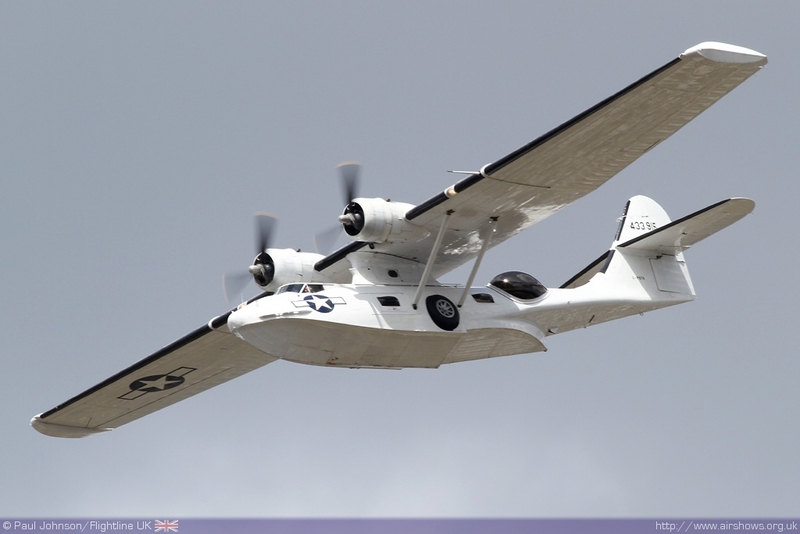 The aircraft was drawn from the United States Air Force in Europe fleet and was a completely standard example. Eastern European participation has been much reduced in recent years. 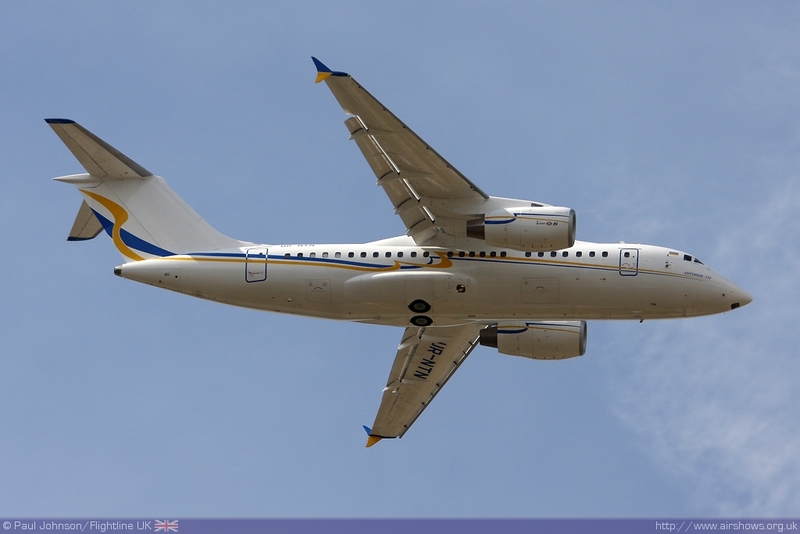 2010 however saw two new airliners from Russia and the Ukraine. 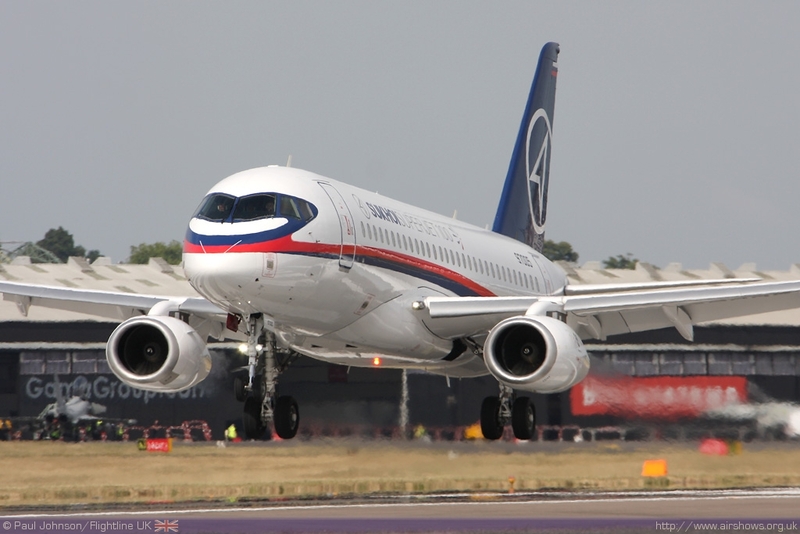 Sukhoi displayed it's Superjet 100 for the first time at Farnborough with a more impressive performance than the rather flat flypasts when it appeared at RIAT. 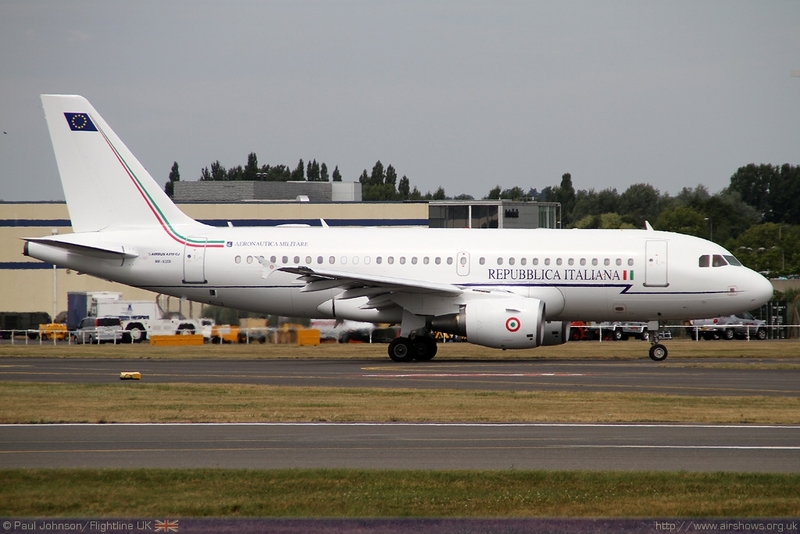 Aimed squarely at similar markets as the Boeing 737 and Airbus A319 it has already attracted some impressive orders. 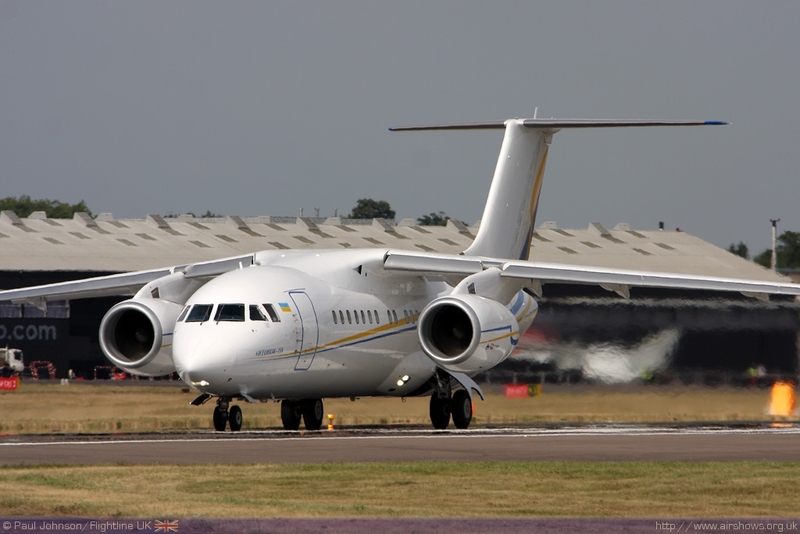 Antonov exhibited their latest small airline, the Antonov An-158 developed from the An-148 military airlifter. 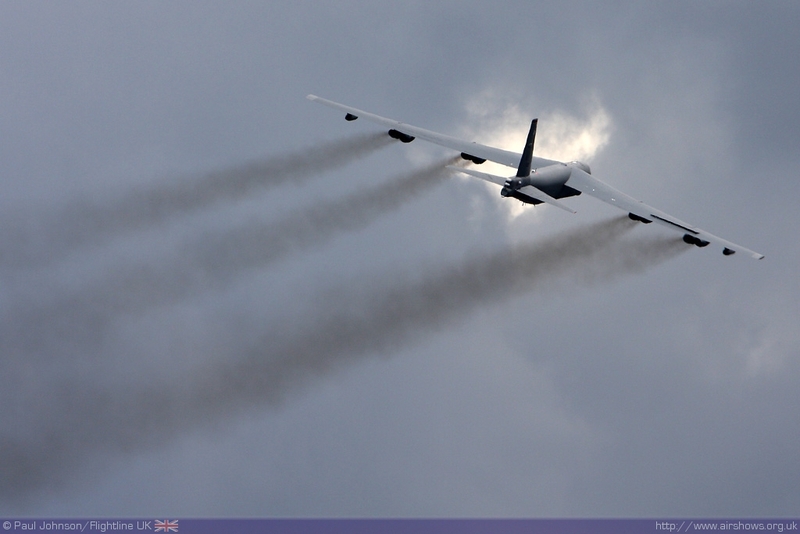 Like the Sukhoi, the Antonov's display was nowhere near as dramatic as an Airbus display, but a welcome new shape in the skies over Farnborough. 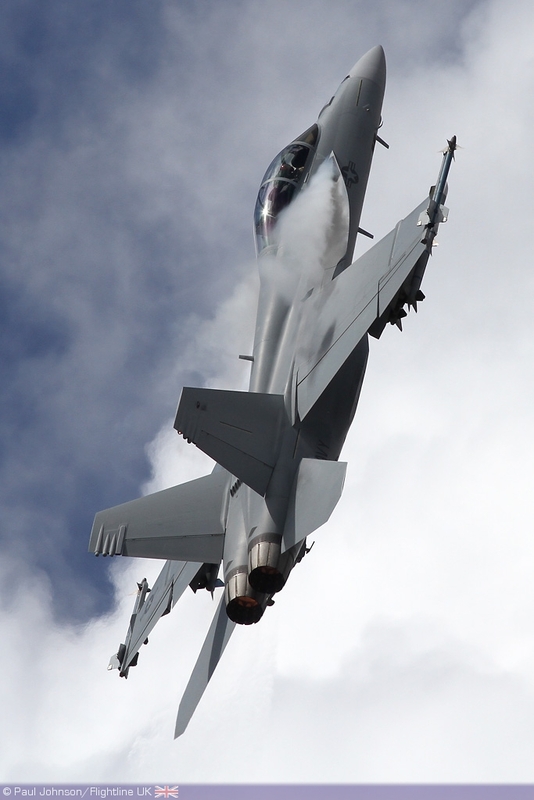 There were plenty of fast jets on show. 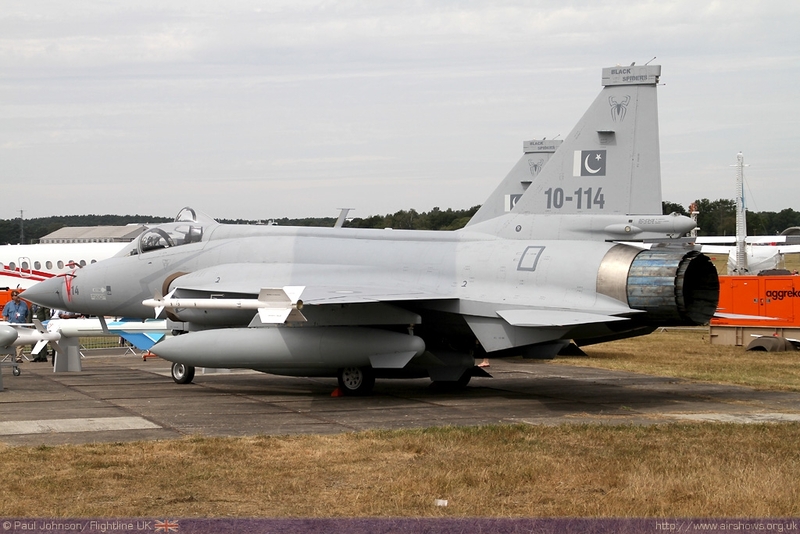 The most exotic were a pair of Pakistani Air Force JF-17 Thunders which were on static display. 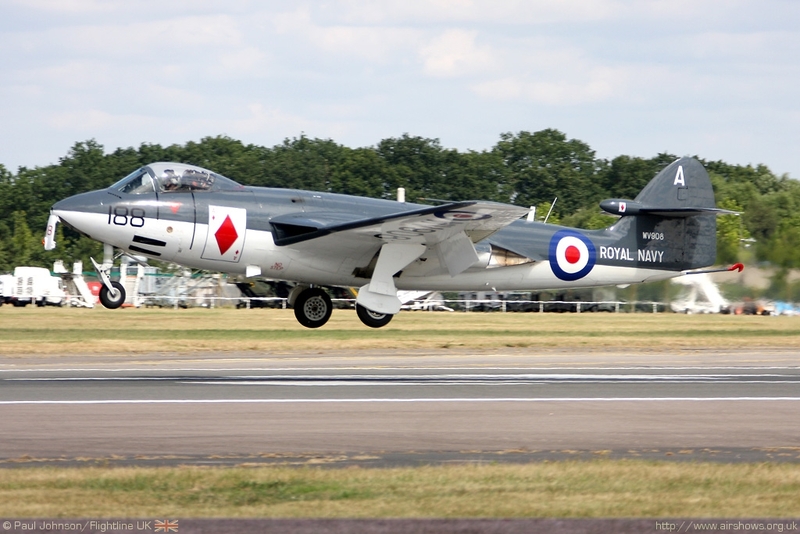 These lightweight fighters were developed with China (which calls the aircraft the FC-1) and the examples on show were from No 26 Squadron "The Black Spiders." In the air, there was the more usual selection of types. 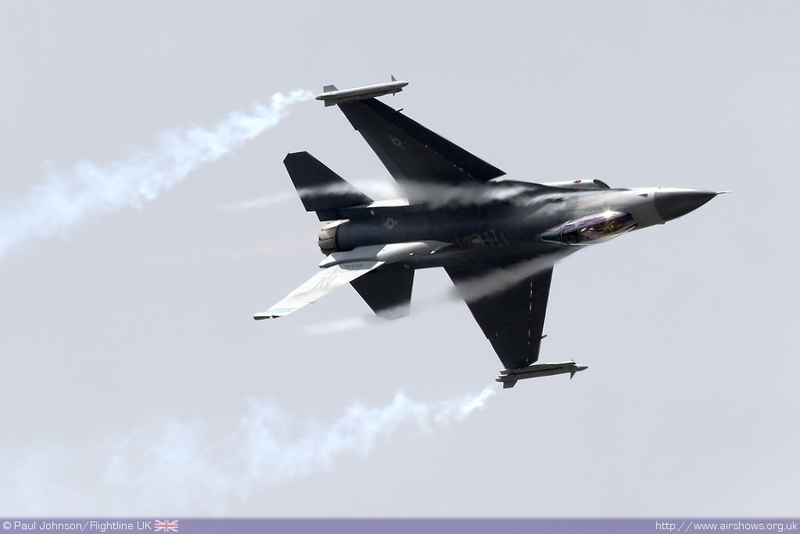 The Lockheed Martin F-16CJ Fighting Falcon gave its usual sparkling performance throughout the week. 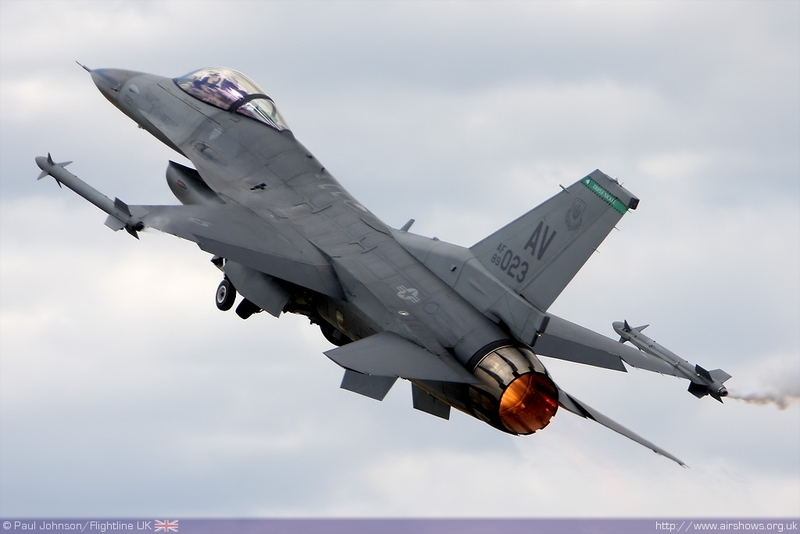 The F-16 has been performing at Farnborough for over thirty years now but the type is still in development with keen interest from the former Warsaw Pact nations and the Middle East. 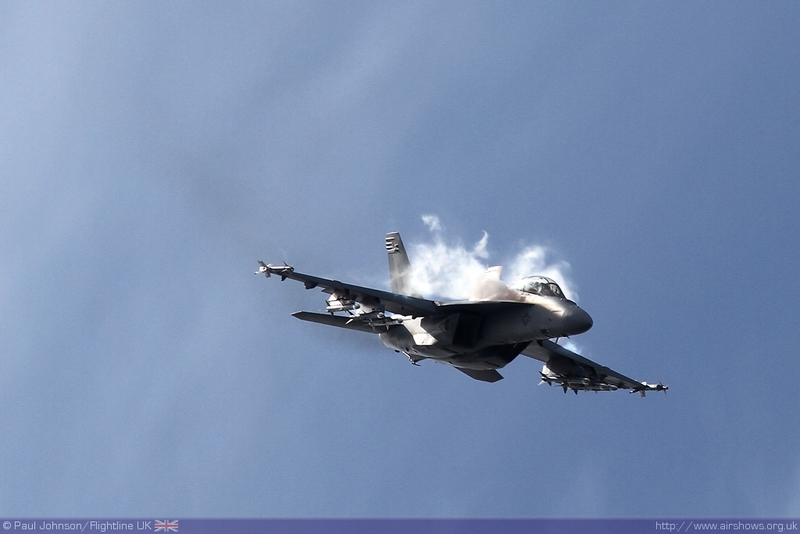 Another Farnborough regular in recent years has been the Boeing F/A-18F Super Hornet. 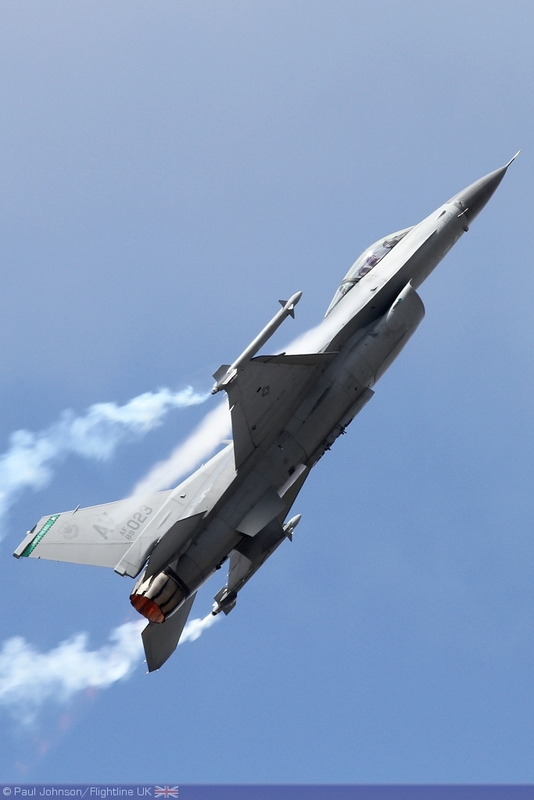 The aircraft puts on a quite amazing display showing the types ability to perform very sharp 90 degree turns despite carrying a representative weapons load. 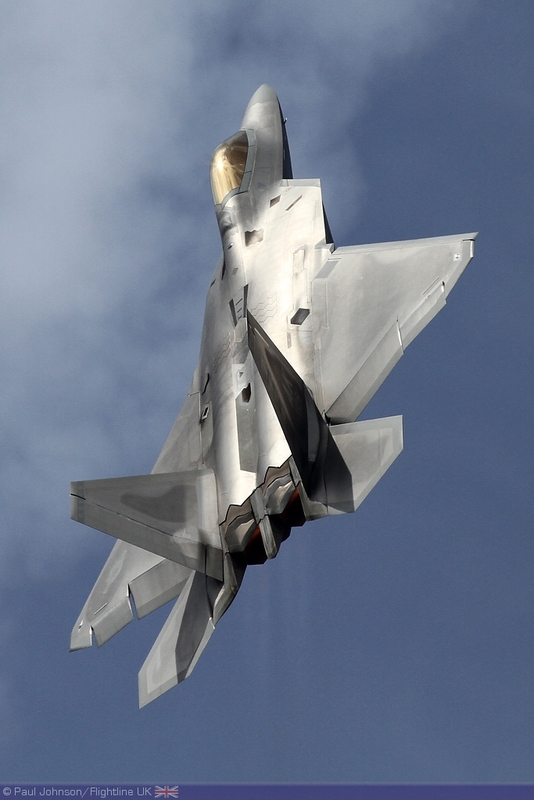 Star of the American line up of fast jets though had to the Lockheed Martin F-22A Raptor. 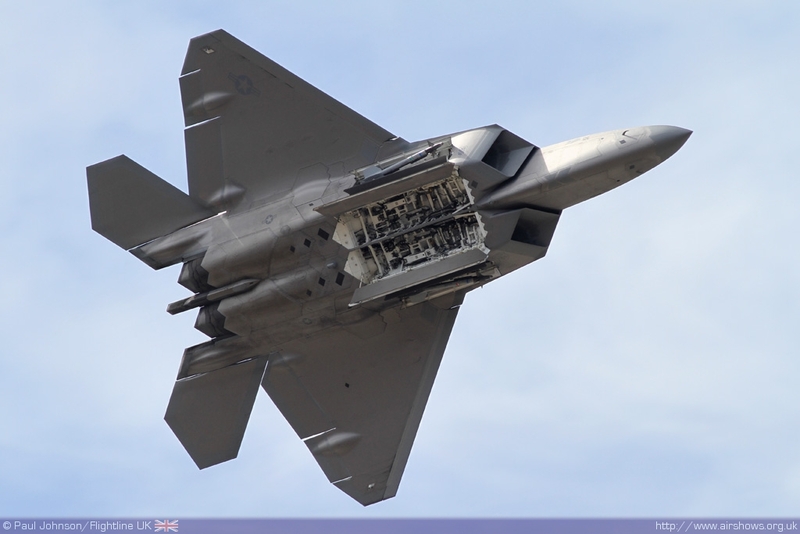 Appearing during just the first few days and operating from RAF Fairford following the Royal International Air Tattoo, the Raptors thrust vectoring abilities stole the show during Monday and Tuesday. 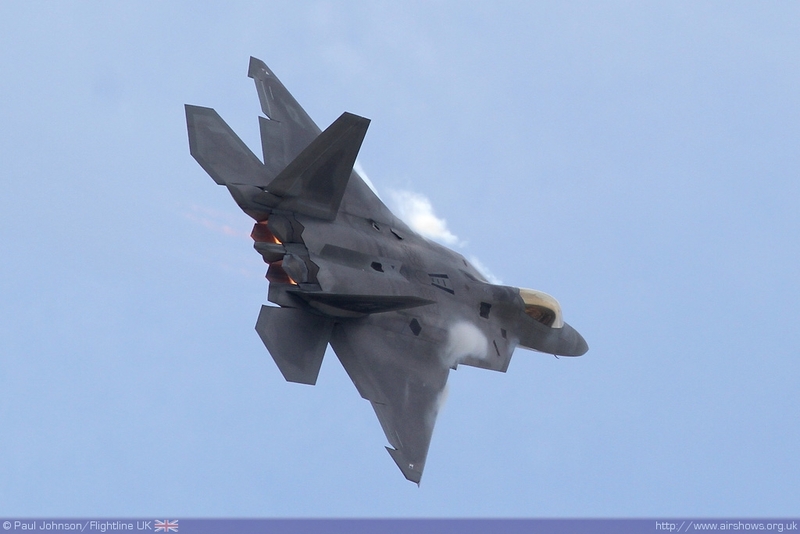 The commentary may have been a little more subdued that it was at RIAT, but this is perhaps now the ultimate airshow fast jet display! 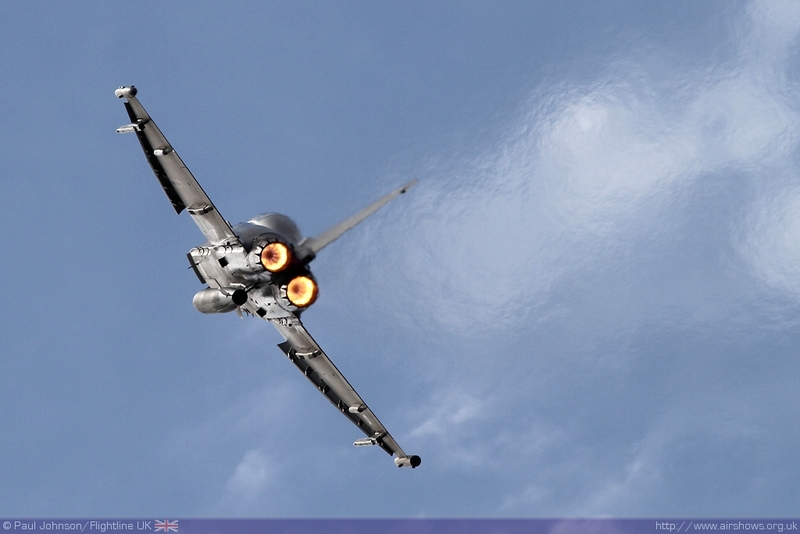 Eurofighter Typhoon were very well represented. 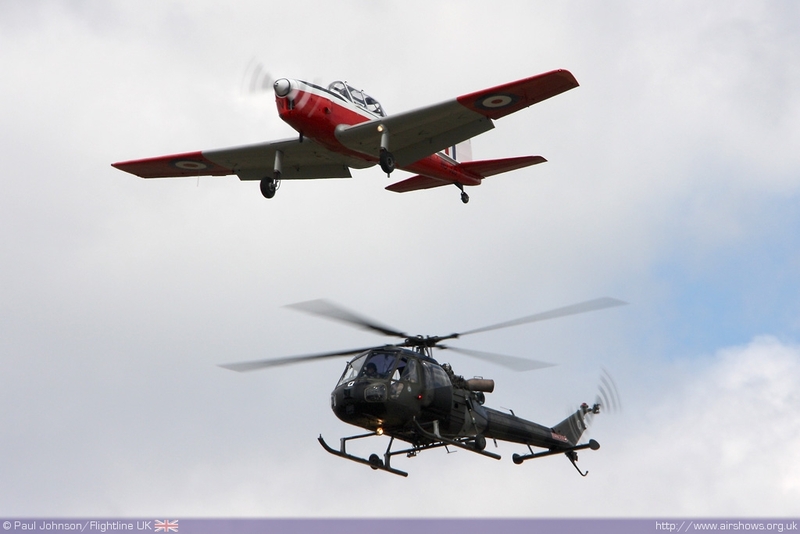 A static example from Finmeccanica was joined by two very different displays in the air. 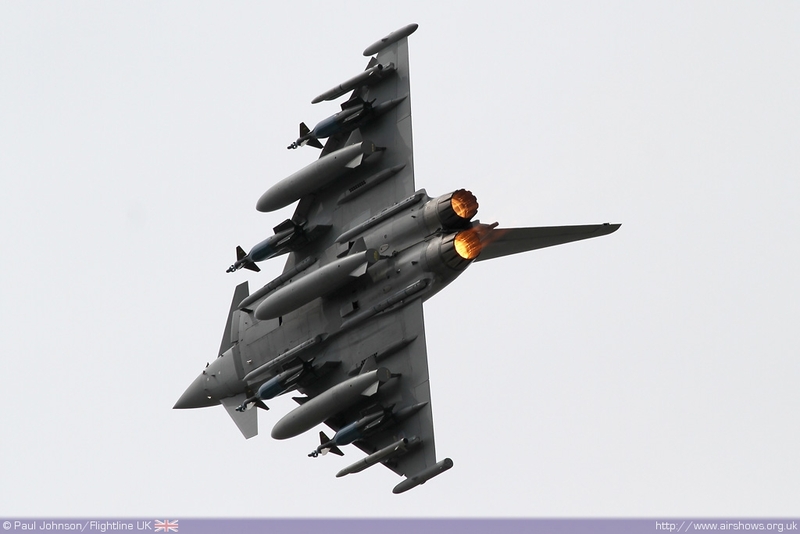 The early part of the week saw displays from the RAF solo Typhoon FGR4/T3 flown by Flt Lt Tim Clements of 29(R) Squadron. 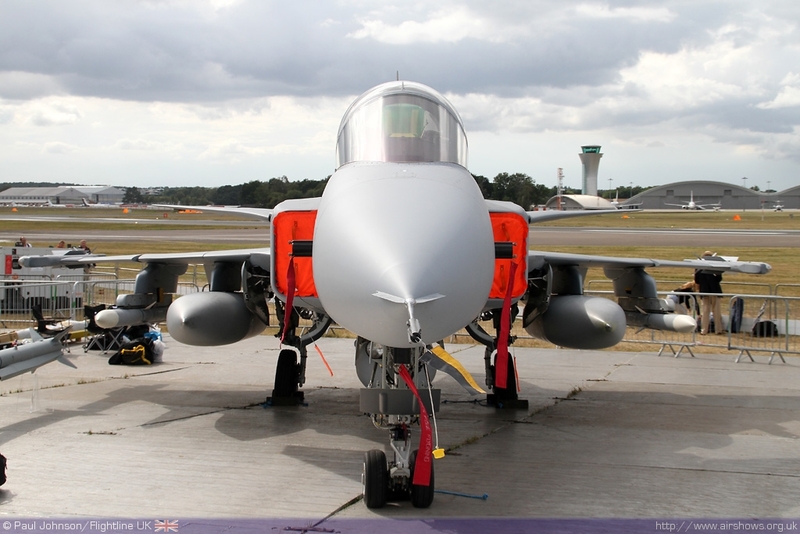 However, throughout the week, there were displays from Typhoon IPA6, a development Typhoon from BAE Systems Warton. 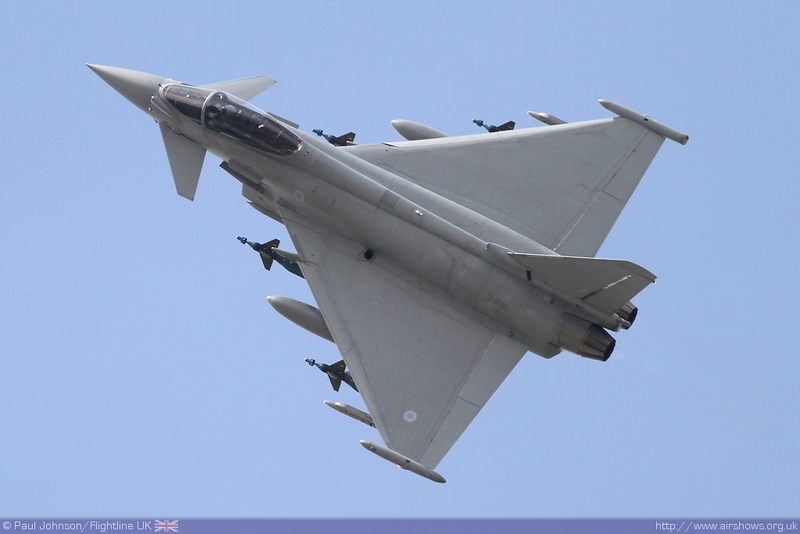 It was a rare chance to see a Typhoon carrying a full weapons load with all 13 weapon stations carrying fuel tanks, guided bombs and air to air missiles. 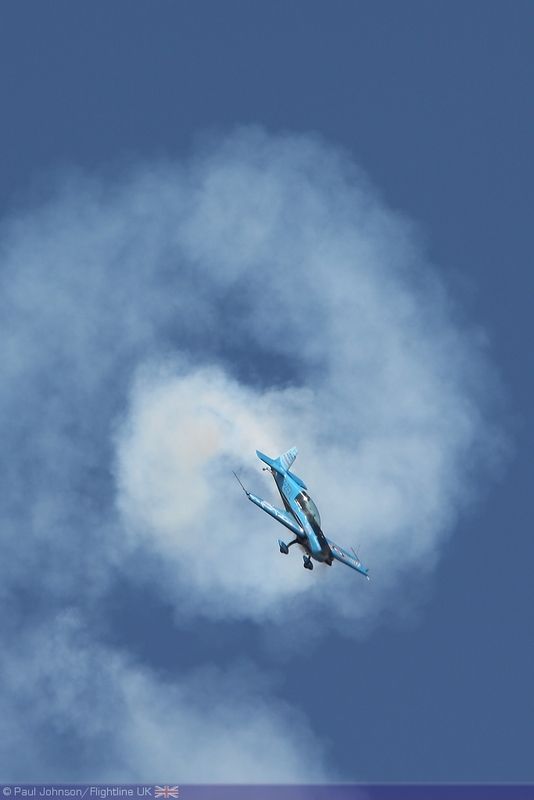 Whilst not as "aerobatic" as the RAF display, it was certainly a powerful performance that includes some impressive demonstrations of the aircraft's agility! 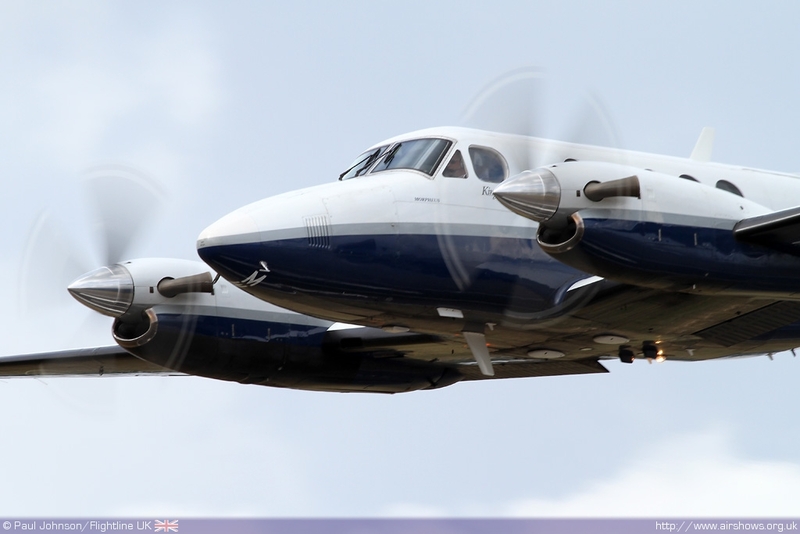 Also from the RAF, the Hawker Beechcraft King Air B200 made a number of appearances throughout the week in the hand of Flt Lts Leon Creese and Dave Mason. 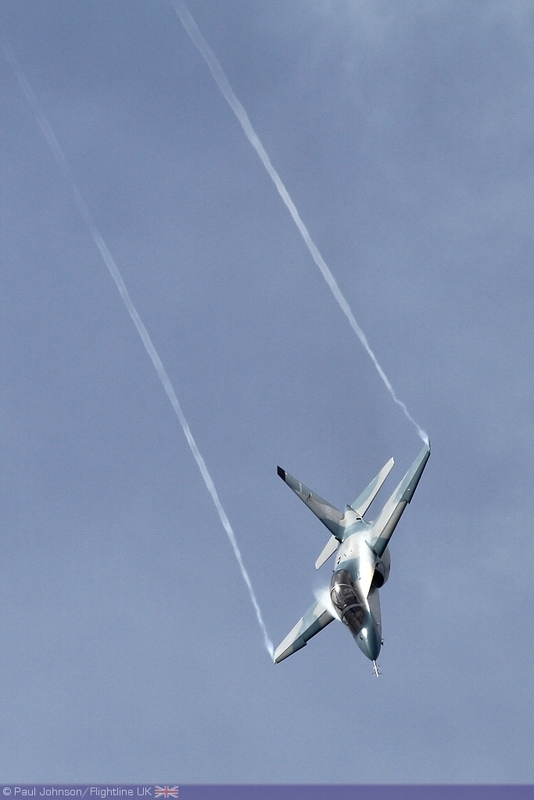 The only other "European" jet in the flying displays was the Aermacchi M346 Master which gave a noisy account of itself. 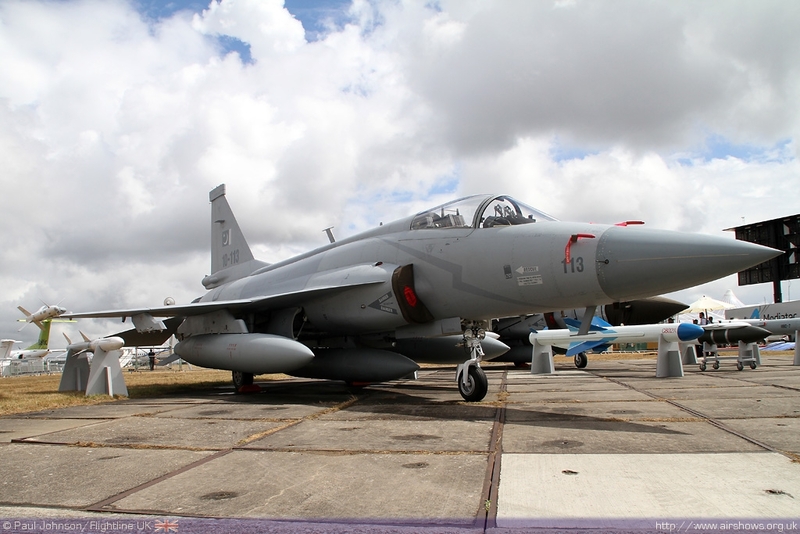 Developed from the Yak-130 advanced jet trainer, the aircraft has been thoroughly modernised by Alenia Aermacchi and it's due to enter service with Italy, Singapore and the United Arab Emirates. 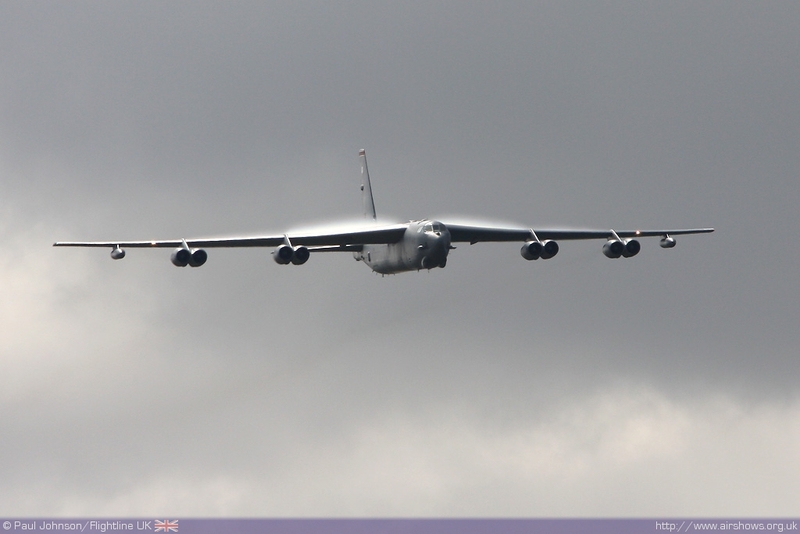 Further miitary flying was provided by a United States Air Force Boeing B-52H Stratofortress which perfomed flypasts over Farnborough from Wednesday through to Sunday. 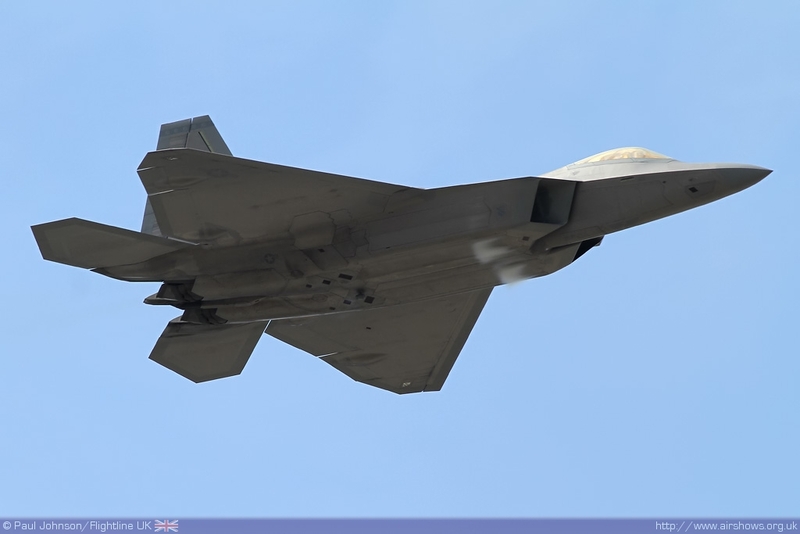 As with the F-22, the aircraft operated from RAF Fairford and also took in displays at Sunderland International Airshow as well at the weekend. 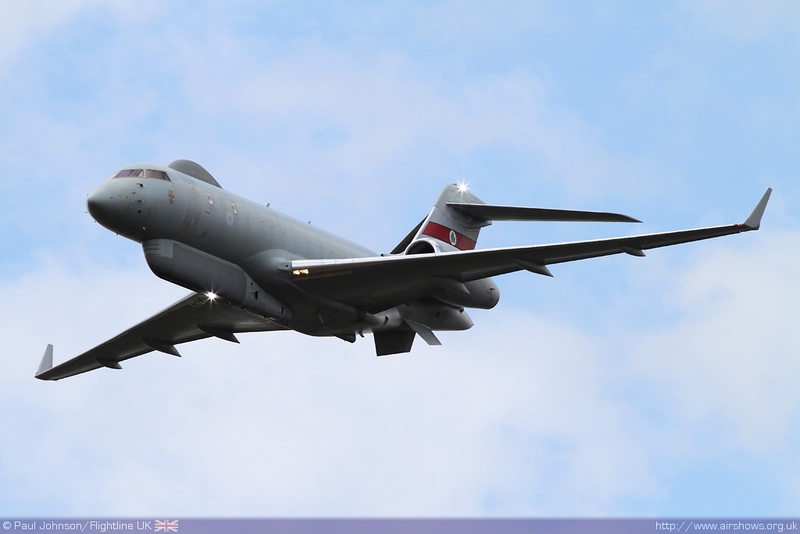 The Royal Air Force also showed off one of it's recently aquired Raytheon Sentinal R1 ISTAR aircraft from RAF Waddington on some of the Trade days. 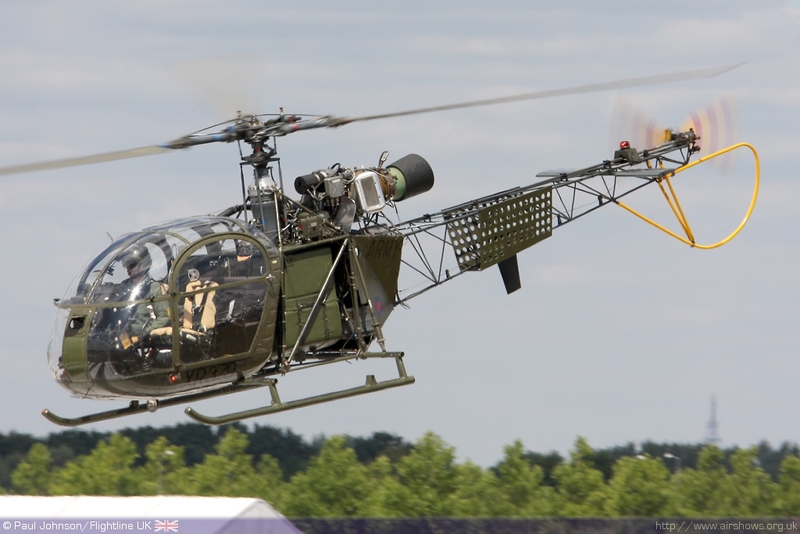 AAs ever, there was some other really rare military gems hidden away in the Static. 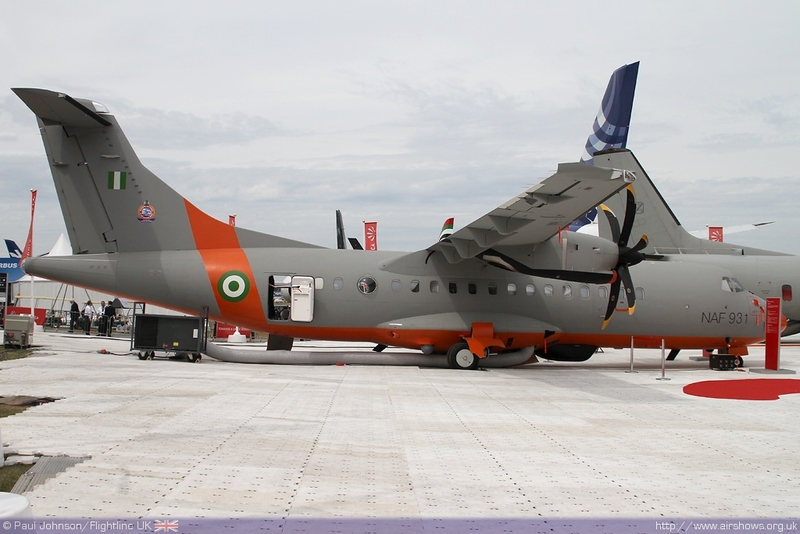 The somewhat pack Finmeccania contained everything from the AgustaWestland Wildcat to a Nigerian Air Force ATR-42MP aircraft. 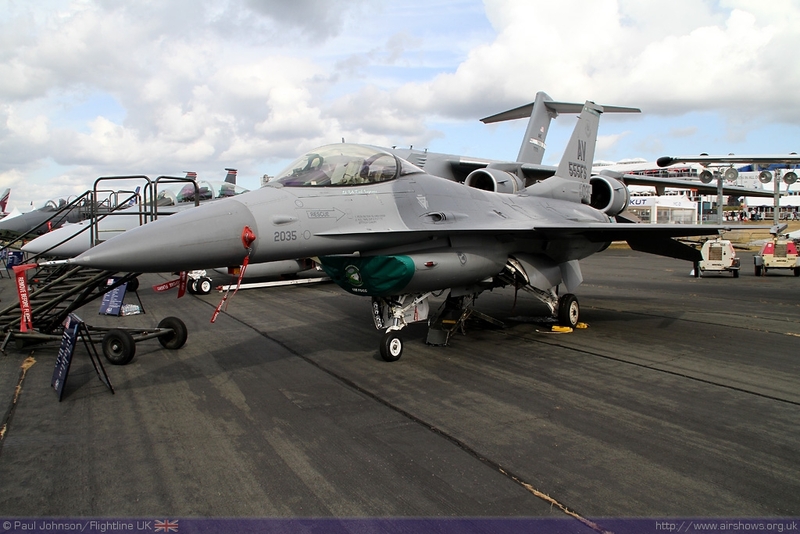 The US Department of Defence area was also filled with exciting aircraft. 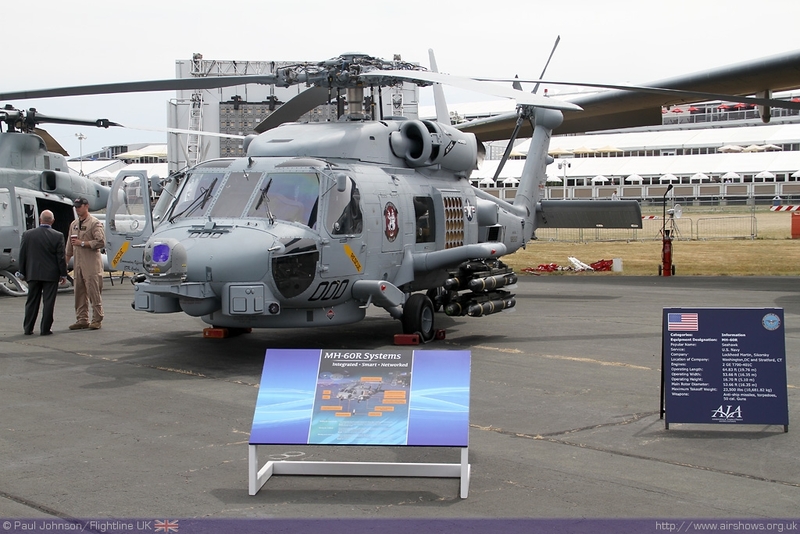 There were examples of the MH-60S Seahawk and the UH-1Y Venom helicopters alongside a Turkish Air Force Boeing 737AEW&C Wedgetail, C-17A Globemaster III and static examples of the F-16CJ and F/A-18F. 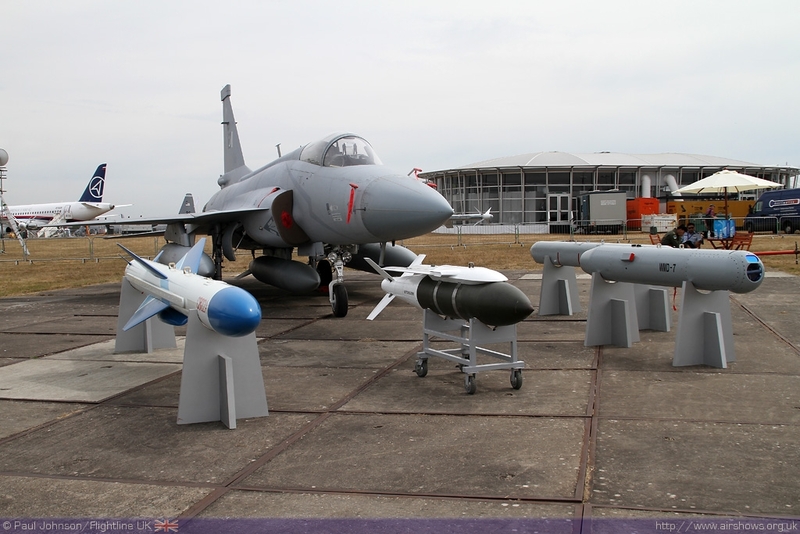 SAAB were a late attendee with their Gripen NG demonstrator while BAE Systems were showing off the Hawk T2 (Mk.128). 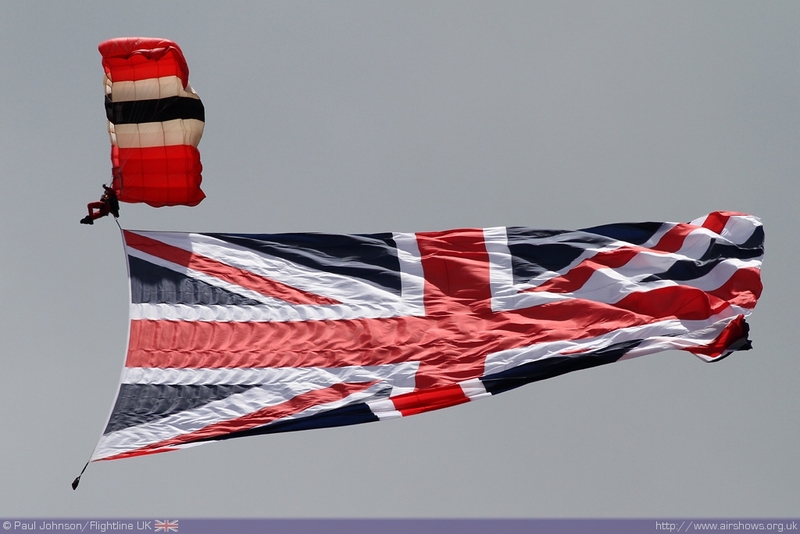 You can always rely on Farnborough to throw up the very weird and wonderful. 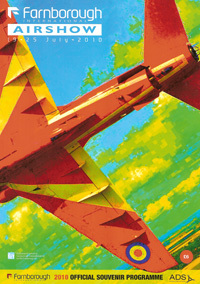 In the static park, Air Tractor exhibited their AT802 Counter-insurgency aircraft. 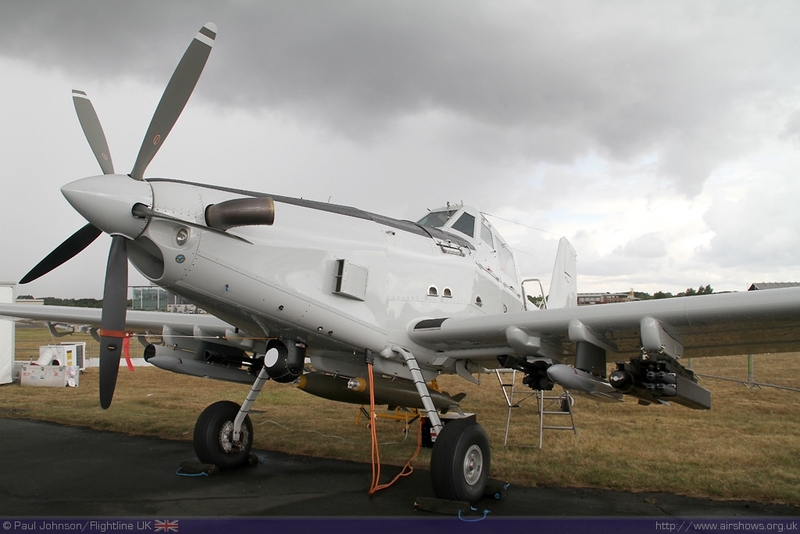 Based on their successful agricultural aircraft, the AT802 is a strengthened, armoured aircraft shown off carrying mini-guns, bombs and rocket pods. 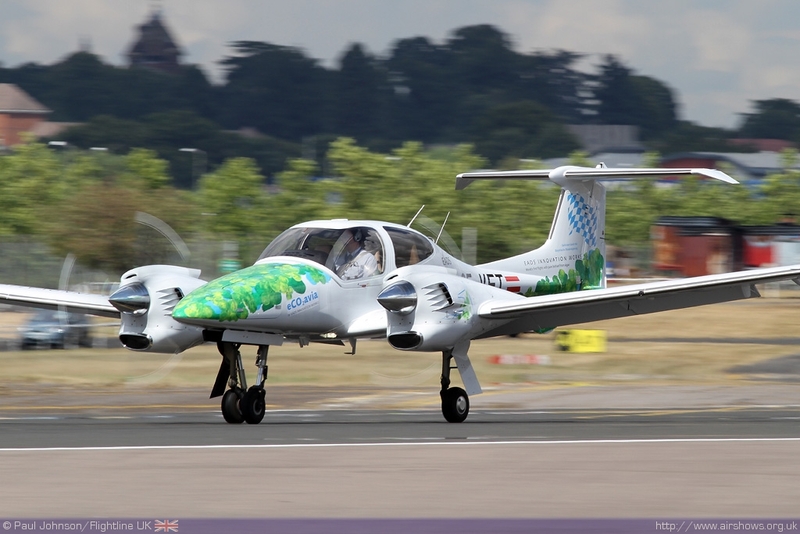 In the air display, EADS exhibited a Diamond DA42 Twin Star powered by fuel produced by Algae. 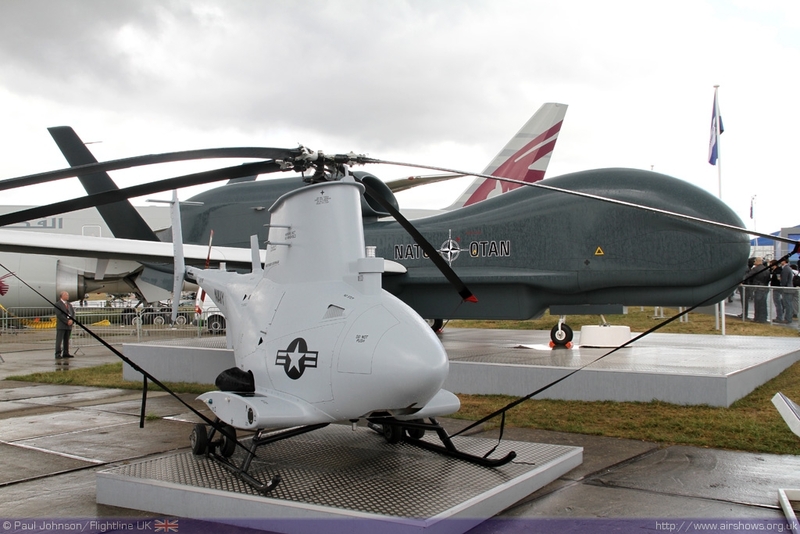 Unmanned Aerial Systems also were high on the Farnborough agenda. During the trade days, there were flying demonstrations outside while some of the very small systems were shown off in a special area within the halls. 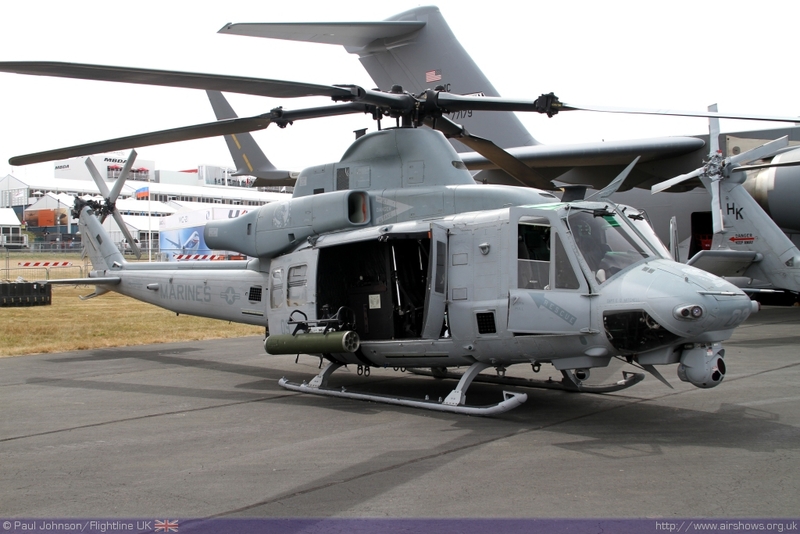 There were also mock-ups of the new Northrop-Grumman RQ-4 Euro-Hawk and MQ-8 Fire-scout. 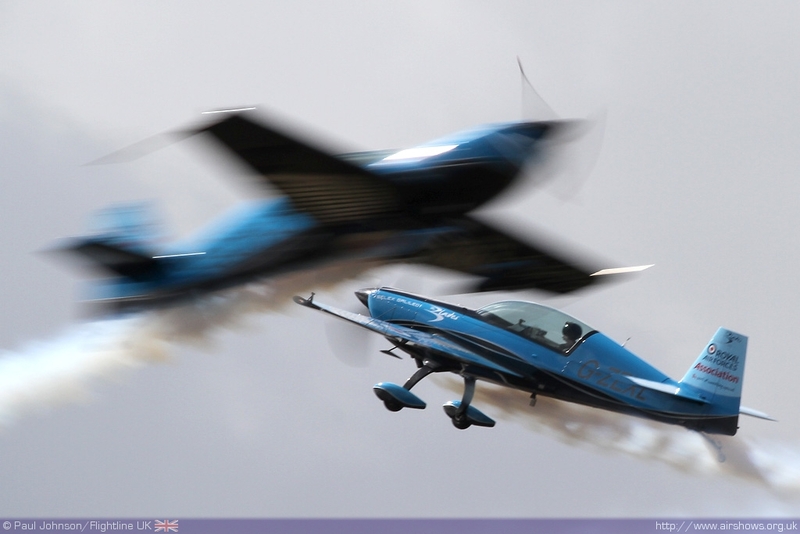 The Blades were particularly busy at Farnborough. As well provided their usual excellent display every day of the show, the team were also doing one or two corporate flights a day during the mornings of the show. 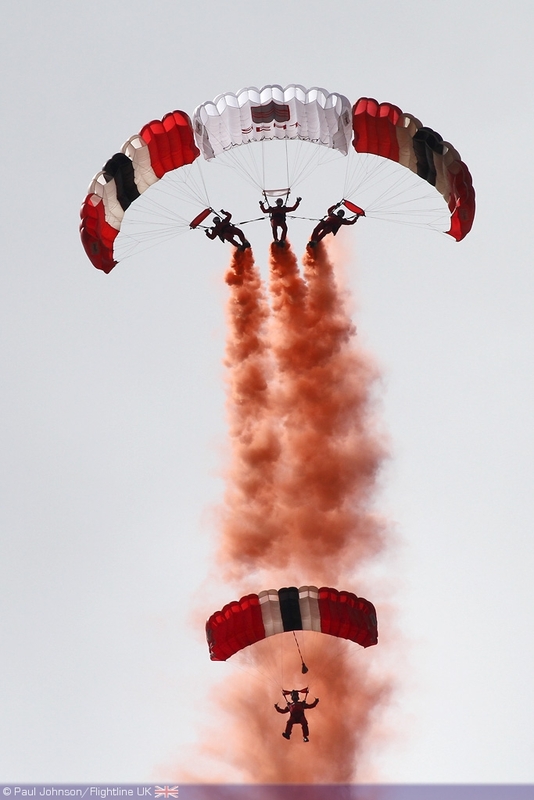 The Red Devils Parachute Team was also kept busy dropping in at various point durin the Farnborough week. The end of Thursday saw a fair amount of change at Farnborough. Friday, Saturday and Sunday saw the show change from its trade guise in its public guise - more entertainment than business. 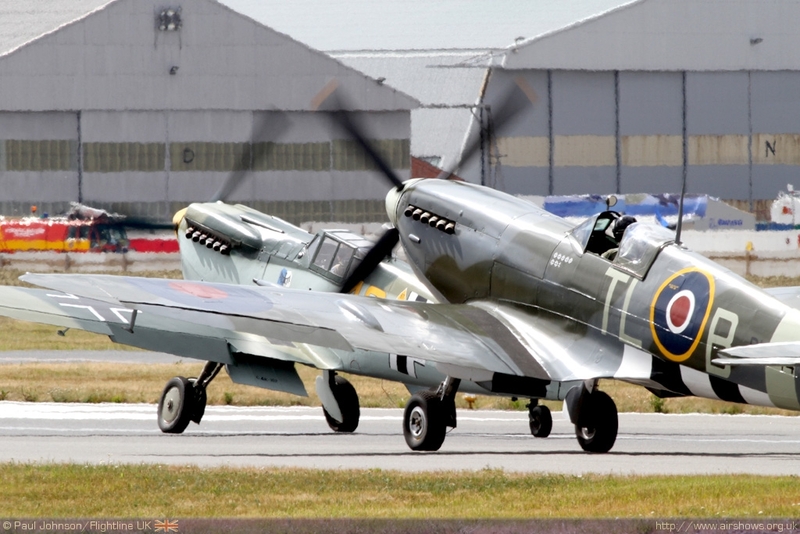 That change was marked by the departure of some of the static and flying display aircraft that had appeared since Monday and they in turn were replaced by the warbirds and civilian displays that form the backbone of the UK airshow circuit. 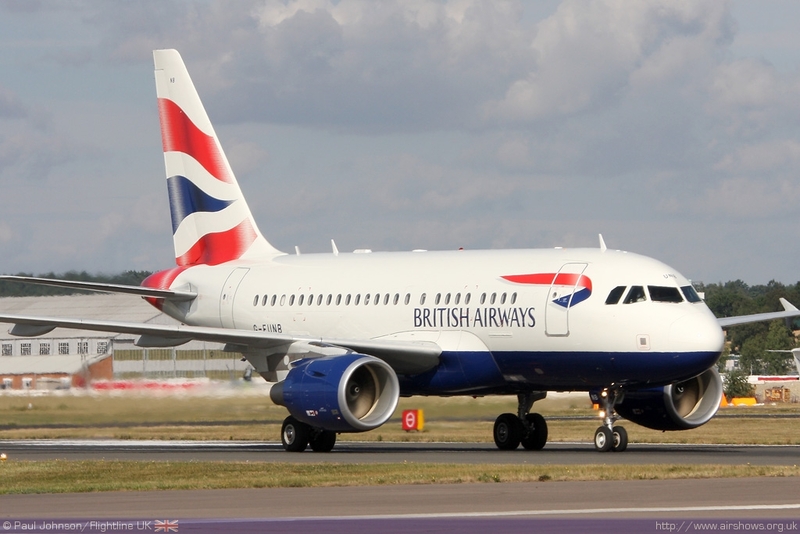 One odd arrival was a British Airways Airbus A318 for static display and walk-throughs. 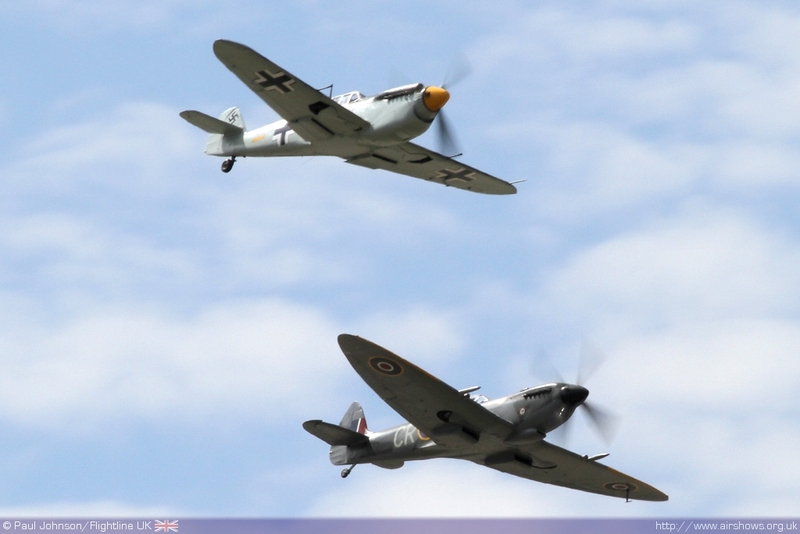 The 70th Anniversary of the Battle of Britain was one of the key themes in the public day flying displays. 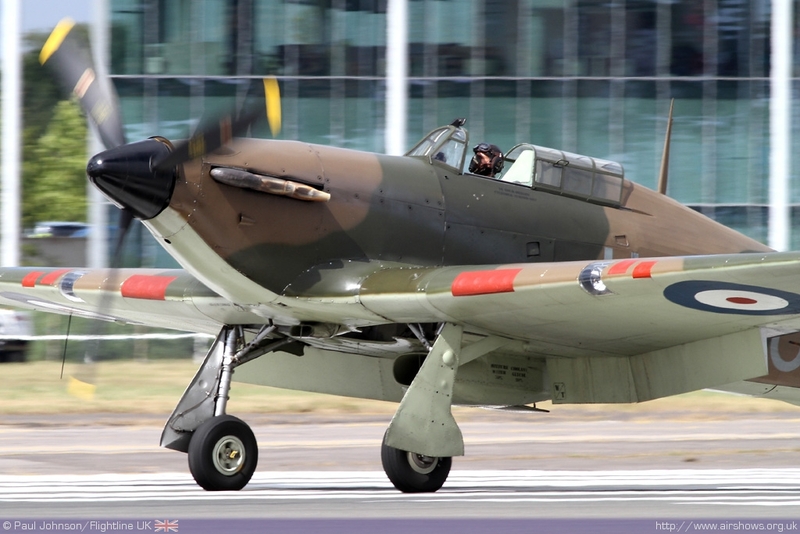 Opening a sequence of warbird displays during the public days was the Historic Aircraft Collection's Hawker Hurricane XII giving a solo display. 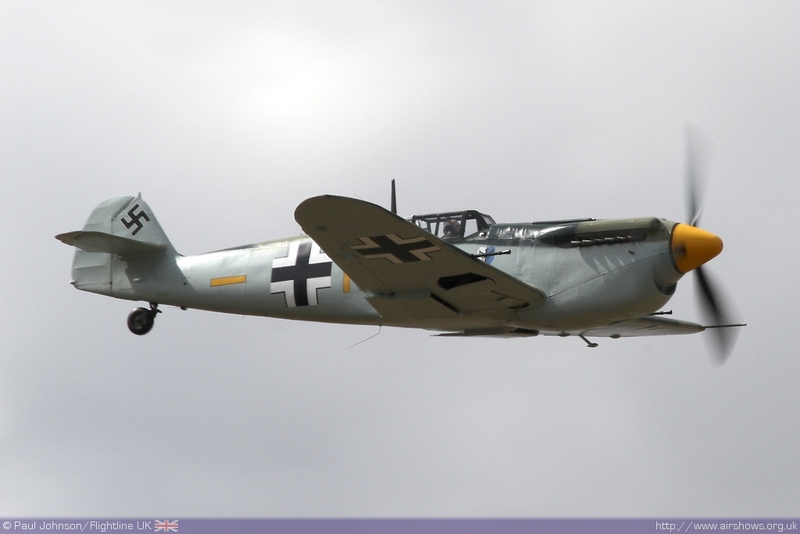 It was followed by a tailchases and solo displays by the Aircraft Restoration Company’s Spitfire IX, Spitfire XVI and HA-112-MIL Buchon (Me109J). 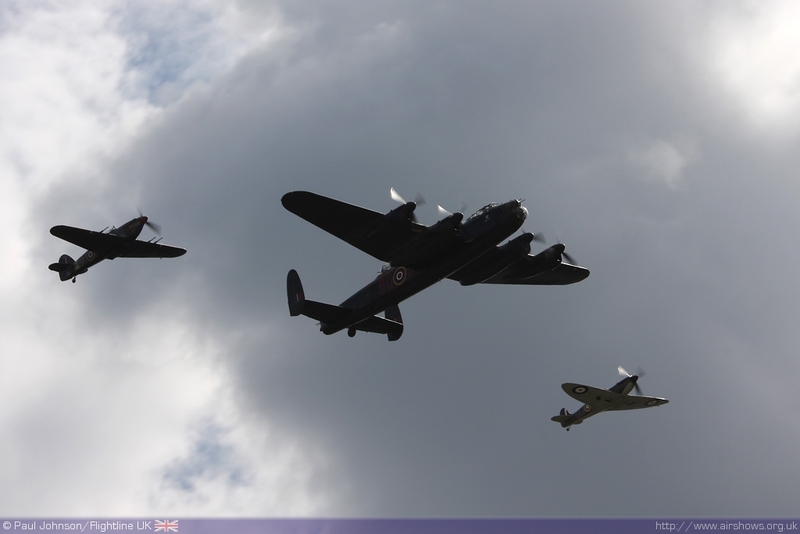 THe sequence was closed by a display by the Battle of Britain Memorial Flight with their Lancaster, Spitfire IIa and Hurricane IIc. 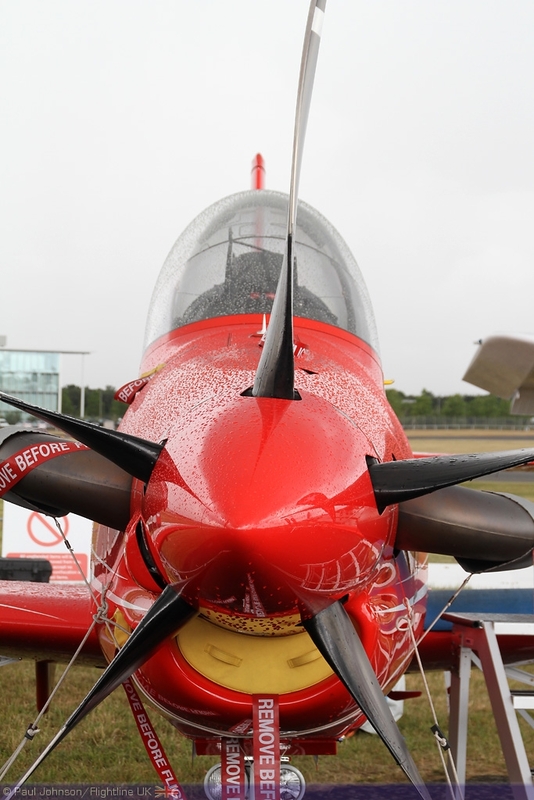 The warbirds were a welcome addition to the weekend flying, but the impact they made was compromised by Farnborough's somewhat strict display regulations. 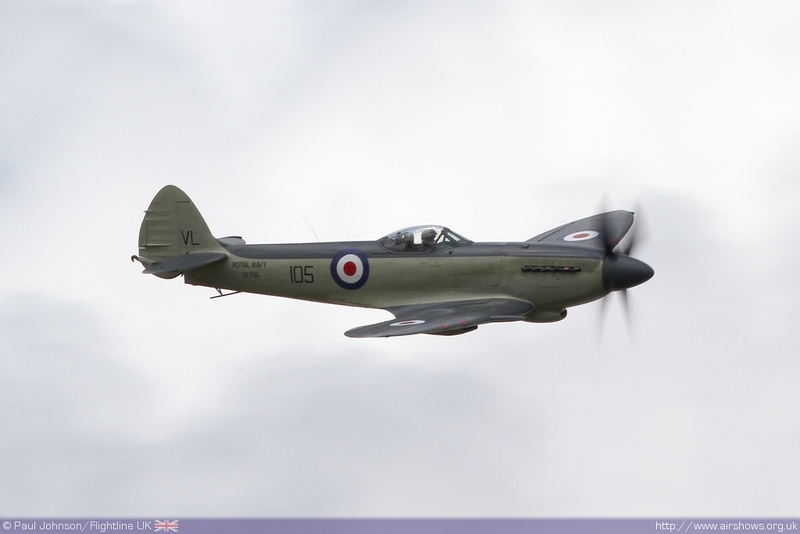 Further historic displays were provided by the Royal Navy Historic Flight's Hawker Sea Hawk, Kennet Aviation's Seafire XVII, the Army Air Corps Historic Aircraft Flight and the Great War Display Team. 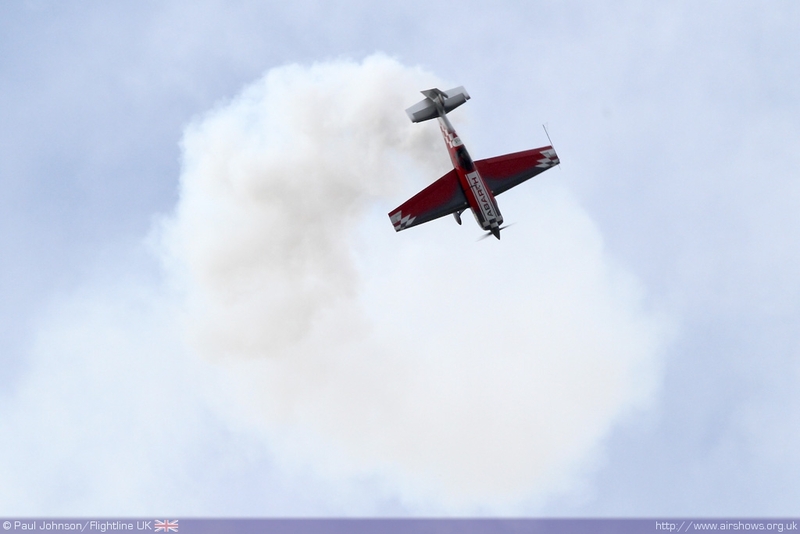 More aerobatics were also added to the weekend displays with former UK National Aerobatic Champion Mark Jefferies displaying his Extra 330SC aircraft. 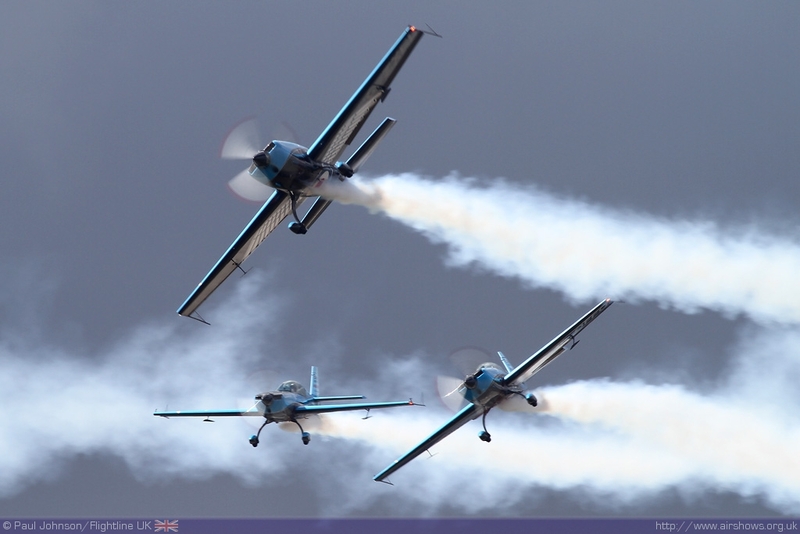 This aircraft is a leap ahead of the old Extra 300LPs displayed by the Blades and capable of some mind-blowing aerobatic figures which Mark displays so well. However, there were only two star acts of the show for many. 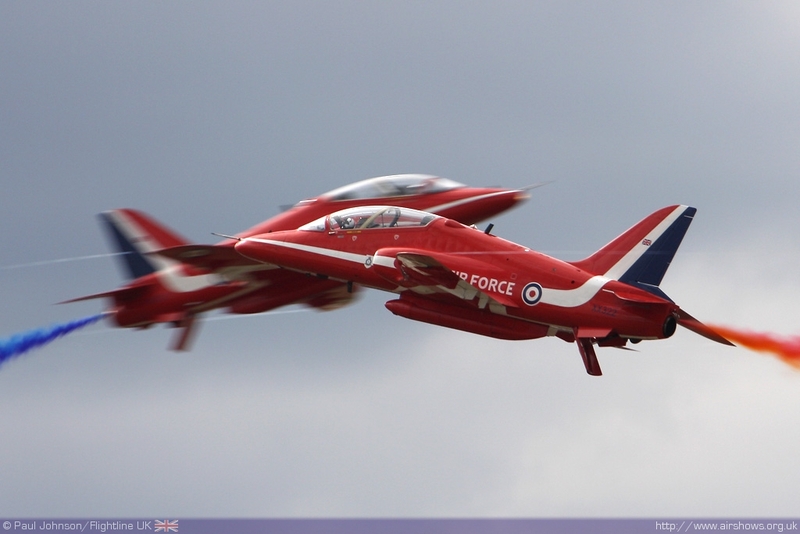 The Red Arrows always provide a thrilling focal point of Farnborough Airshows, and 2010 was no different. 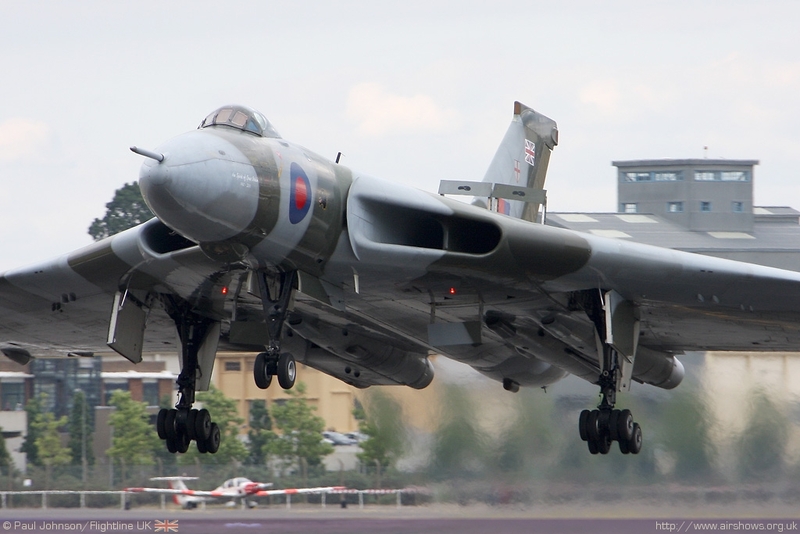 The other was Vulcan XH558. 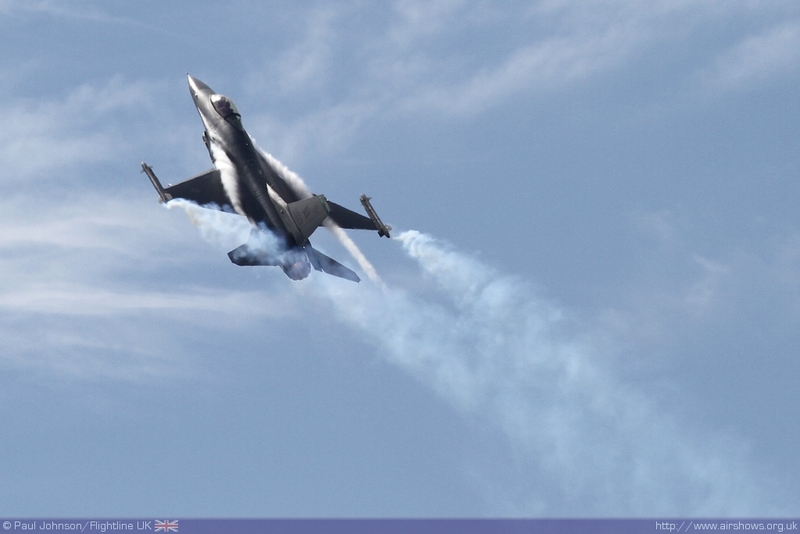 Her displays on the Wednesday, Friday and Saturday were clearly a major highlight of the flying displays. 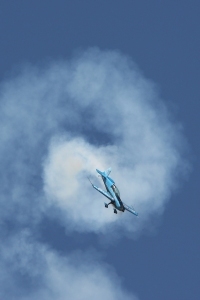 Sadly, one of the aircraft brake units failed on landing after Saturday's display meaning she was unable to display on the final day. 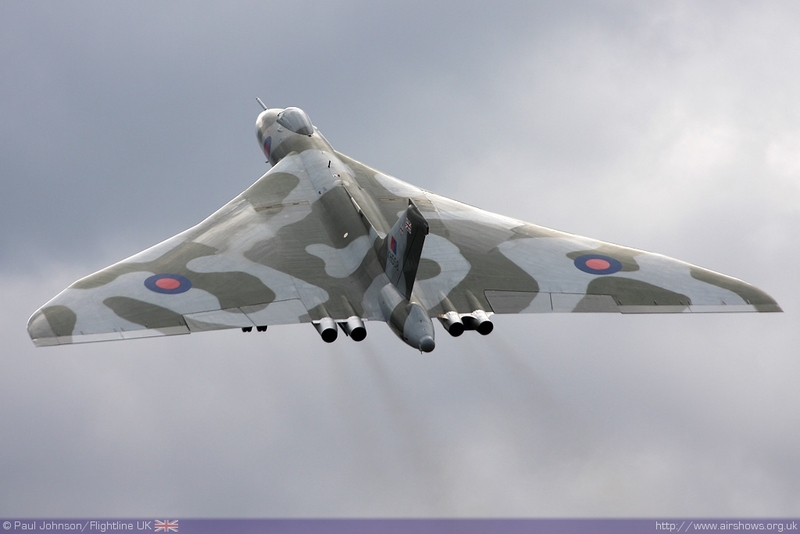 Vulcan to the Sky clearly value Farnborough as a place to attract interest from the Aviation industry with a large presence on the ground as well the aircraft's own flying displays. 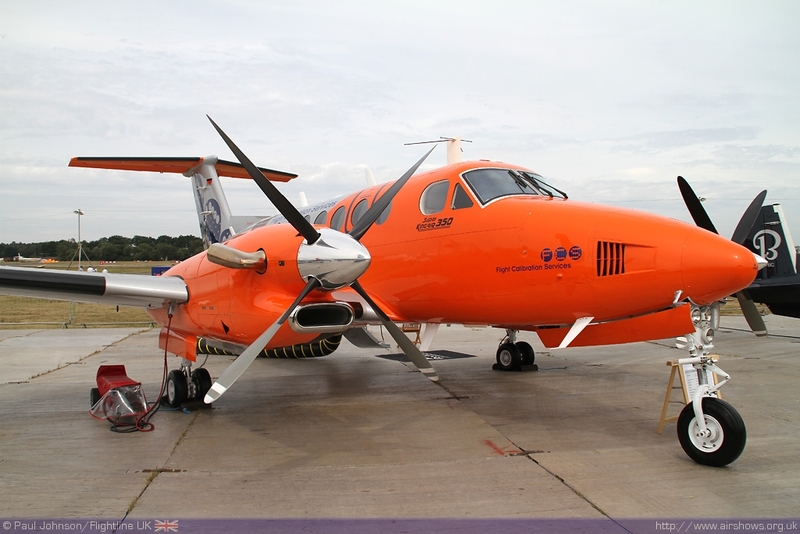 In terms of the week as a whole, Farnborough International 2010 was a great success with some exciting new aircraft on show and plenty of business. 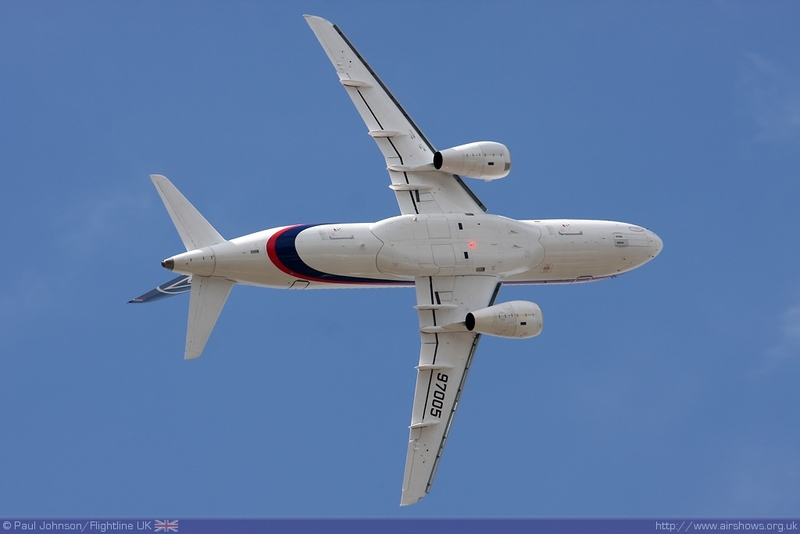 For the public and enthusiasts, there was great disappointment with the number of "stars" leaving the show early such as the Boeing 787 and Airbus A400M. However, the flying displays were very well balanced over the weekend providing something for everyone. 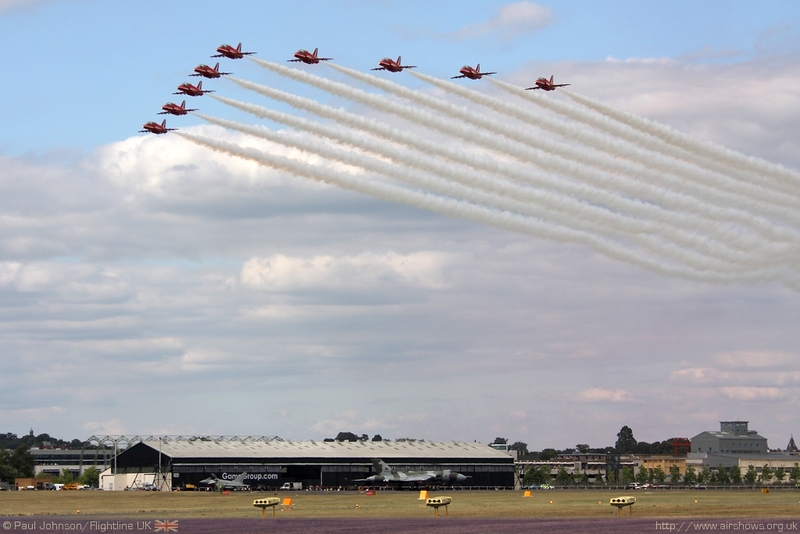 The airshow was also packed to absolute capacity over the weekend too and simply leaving the venue and car parks was an adventure all in itself with long delays at Pedestrian and vehicle exits. Hopefully, the organisers will look at issues before the show returns in 2012.